I am finishing up a year I decided I would devote to studying the sea-ice of the arctic and, while I do not approach the expertise of the men who devote their entire lives to such study, I have learned a lot, and feel I can safely say the reporters who write the sensationalist headlines about “the vanishing ice-cap” don’t know a hundredth of what I know, and are basically fools who are talking through their hats. 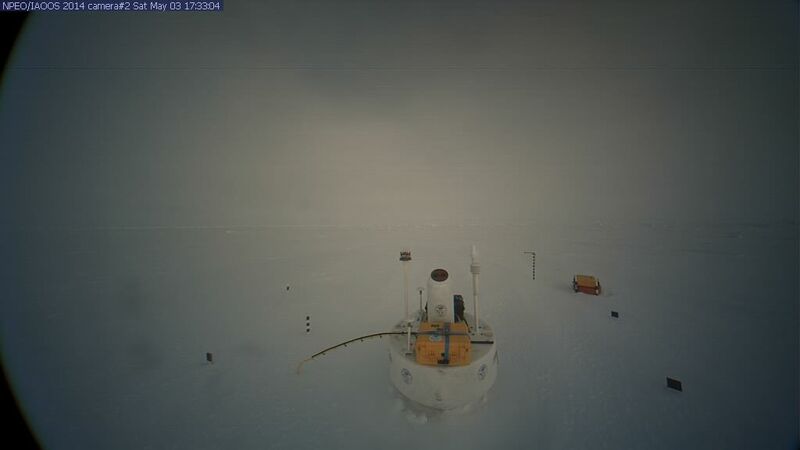 Increasingly I have come to respect the actual scientists who are researching the Pole, even as I feel increasing contempt towards those researcher’s so-called “superiors,” who hold the purse strings, when all they really ought to hold is their own tongues. The one advantage I have over the better scientists is that I don’t have to worry about losing my funding. Nobody funds me. When you’ve got nothing, you’ve got nothing to lose. Therefore I can come right out and say the idea of Man-caused Runaway Global Warming, as any sort of serious threat, is a fraud, and in some cases is a criminal fraud, which is something the better scientists cannot say without risking their livelihoods. 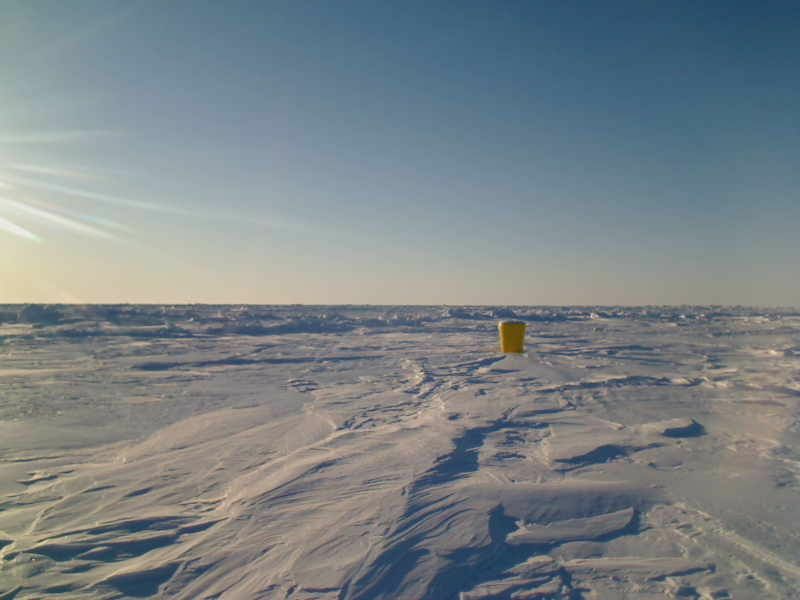 What is wonderful about these buoys is the yo-yo thermometer dangling beneath it, which allows us to measure the temperature and salinity at various levels below the ice. The stratification of arctic waters (and lack of it) is likely crucial to understanding the formation of the sea-ice, and the melting of the sea-ice as well. In conjunction with the Argo buoys in the North Atlantic, we are entering a whole new era of understanding. It is analogous to back when we were first able to measure the upper atmosphere with weather balloons, and produce upper-atmosphere maps. Sadly, there are only 15 of these yo-yo thermometer buoys when there should be 150, (though it is risky deploying even only one of them), however half a loaf is better than none. In these posts I’ve been using what I call my “dead reckoning” approach to the temperature, salinity and stratification of arctic waters, which is analogous to an old, Yankee farmer scratching his jaw as he gazes up at speeding cirrus, and making crafty conclusions about how the jet-stream will effect the weather, even though he doesn’t know such a thing as a jet stream exists. However I prefer to think of myself as a farmer who deduced the existence of the jet stream, and then was thrilled when scientists proved his deductions correct. As I confess my vanity is involved, I also wouldn’t mind learning my hunches were absurd and wildly incorrect, for I’d be learning. 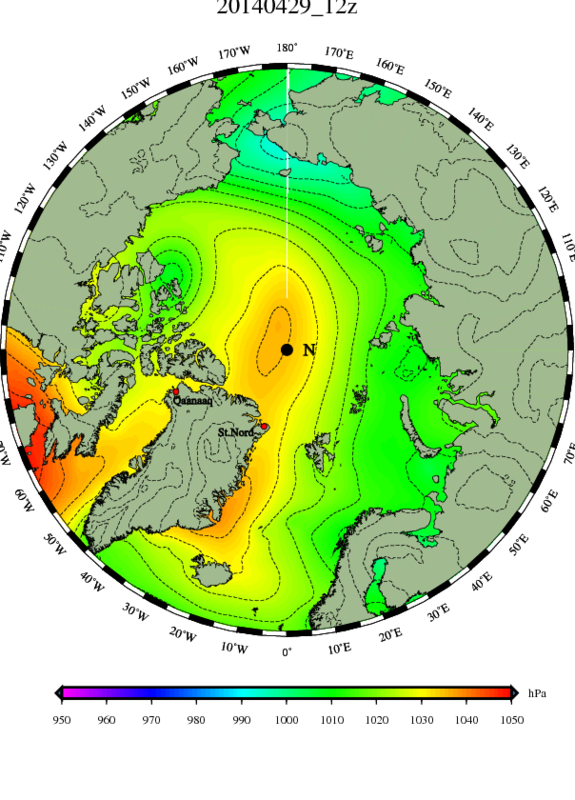 I’d be seeing a window open, as we are the first to see the mystery of currents at various levels under the ice. We are like Balboa, climbing the mountains of Panama and seeing a whole new vista, a whole new ocean, the Pacific, for the first time. The scientists gleaning this data deserve our admiration, respect, and support. They should not have to endure the Bozos and Buffoons they must endure. The data they are gathering is of great value, for as we learn about how the currents shift in the arctic we are going to learn about the difference between the “cold” AMO and the “warm” AMO, and that matters to the farmers and fishermen who feed us, the shippers who provide us our goods, and the many who help us heat our homes. Once we learn about the differences we will be better able to predict, because we will see the differences as they occur, and be able to ascertain the direction things are heading. Although these differences have little to do with “Runaway Global Warming,” they can be as vast as the differences between the Medieval Warm Period and the Little Ice Age. Because even young Boy Scouts like to “be prepared,” it would be nice to know which direction we are heading in. The agenda-driven, political Bozos have invested hugely in the concept Global Warming is causing the icecaps to melt. I wish the icecaps actually were, because another Medieval Warm Period would be kind to humanity, however, in the short term at least, it looks like our recent warm period is ending. The AMO should shift to “cold” in around five years, and is briefly twitching to the “cold” signature even as I write. Both the long-term shift and the current twitch will lead to an increase in sea-ice, and this is likely to be highly embarrassing to the Bozos. I fear this embarrassment, and other examples of their ineptitude, is liable to provoke public outrage and a backlash. I am afraid the good scientists will be accused of guilt-by-association. In fact the Bozos may even point at them and blame them for giving the Bozos bad advice. Politicians seldom admit their mistakes, especially when there is a chance of dumping the blame on an innocent scapegoat. Having made that clear, I need to announce that my self-imposed exile from the writing I most love is coming to an end. 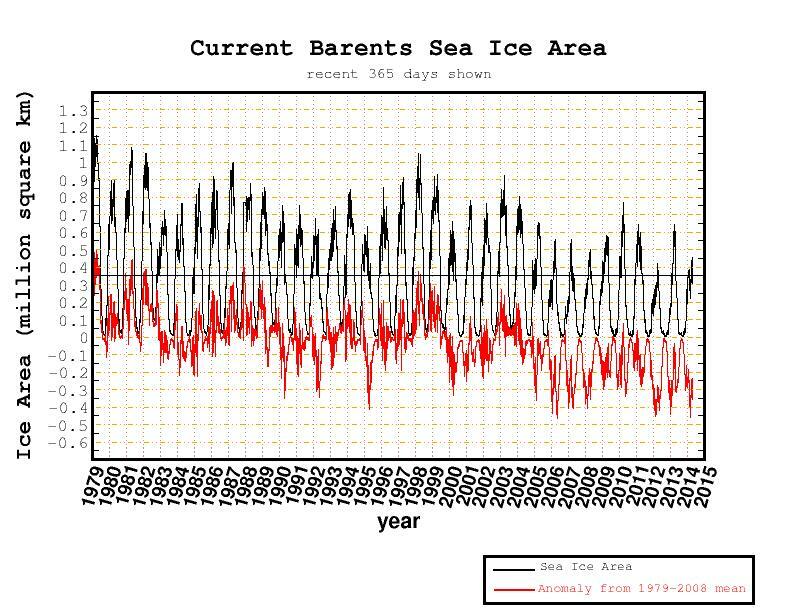 I will continue to post about sea-ice, especially as even the Alarmists expect a “recovery” this summer, and to see sea-ice decrease less. However writing about sea-ice is only a hobby, which happens because I find the scenery very beautiful, (from a distance.) What I really want to write about exposes the ugliness of Bozos from a different angle, as I describe how beautiful Truth is. As this website starts to go through some changes, I will appreciate any feedback I receive. 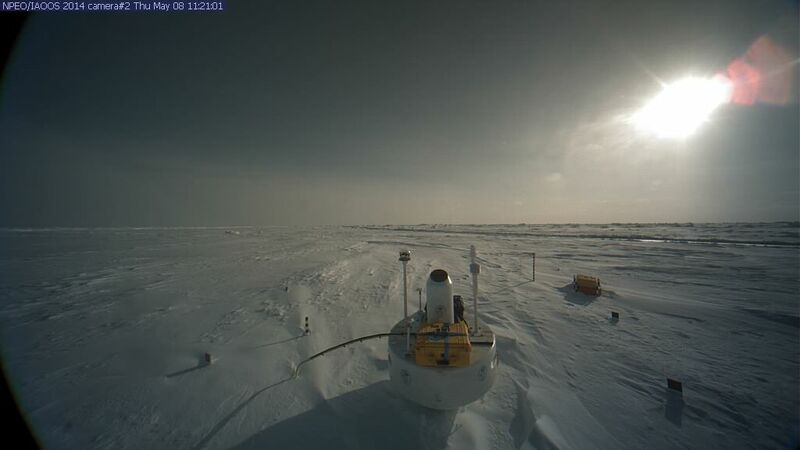 VIEWS FROM NORTH POLE CAMERA ONE —Nine hours apart— The pressure ridge in the left horizon will be a feature to watch, especially the larger knob, to see if it builds or settles with time. The Pole is actually behaving itself for a change. The textbooks always show a Polar Cell (Like Hadley and Ferrel Cells) with air decending at the Pole, creating high pressure there that flows outwards toward the boundary between the polar easterlies and the sub polar westerlies. Storms run along this boundary, generally west to east, in the textbooks. However such a nice and neat “zonal” flow vanishes when blocking occurs and the flow becomes “meridianal.” Then all hell breaks loose: You get cross-polar flows from one side of the Pole the the other, the jet stream loops far to the south and back to the north, the media does back-flips about “the polar vortex,” and so on and so forth. Any semblance of a “Polar Cell” resembles the textbook about as much as a bug resembles a bug, after it has had a meeting with your windshield. For the moment well-behaved and meek lows are politely moving west-to-east around the high, with an interesting low reminding me of summer as it moves along the Canadian coast, and another in northern Scandinavia, and a third over in the Bering Strait. However at the very top of the map is Pacific trouble that is going to derange everything. 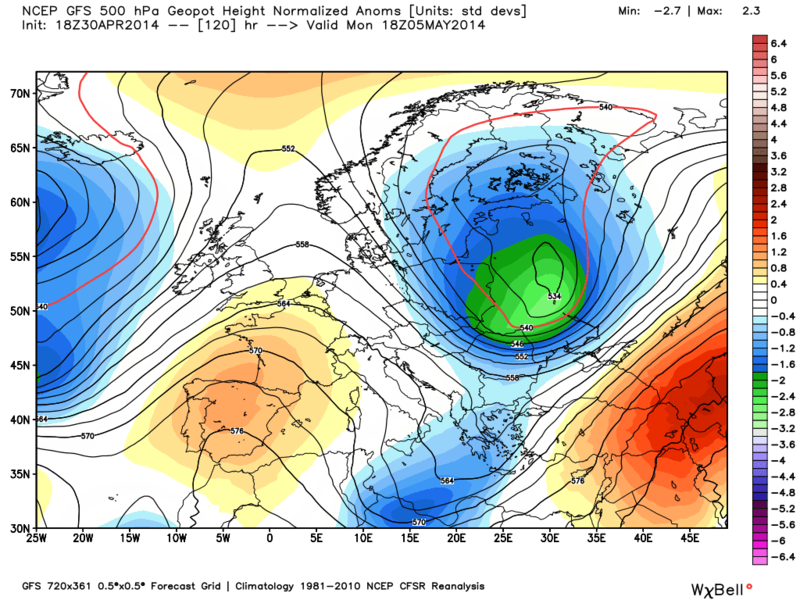 It looks likely to charge north, move the wrong way along the Siberian coast, and loop up to the Pole around Sunday. A which point I’ll pick up my textbook and fling it out the window. “Torn” remains blocked way back to the south of Lake Superior, but as the occlusion zipped up it has kicked ahead its warm sector to the east, and nudged the high pressure ridge over us just enough to the east to start shifting the winds from northeast to southeast, and that is from sea-water that is below-normal off Nova Scotia towards sea-water that is above-normal southeast of Cape Cod. The wind was still northeast at daybreak today, and like yesterday the temperature was 37, barely creeping up towards 40 as the morning passed. However as the afternoon has passed the low scud has started to come from the southeast, and by tomorrow the winds are likely to be south, with temperatures 25 degrees warmer, which will end the state of suspended animation our spring has been stalled in. It is a little colder up around the Pole, and the flow continues down into the Atlantic. The maps show the steady flow out of the arctic has pushed cooler polar air south across Scandinavia, from Iceland to Finland, but hasn’t been able to penetrate south across the British Isles. The occluded and blocked remnants of “Wendy” are drifting east towards Ireland, as “Damper” crosses the Atlantic slowly on its heels. A weak low has come along the Canadian coast and is now moving down into Baffin Bay, where a new low is forming in the weakness between the eastern extension of the blocking high pressure and the center of the block over Hudson Bay. The passage of this ridge will finally allow some milder air to move north, in the Atlantic, though even in five days the winds look like they are still from the north in Scandinavia. The low at the top of the map will drop down over the Pole by Sunday, as the high pressure currently over the Pole is squeezed south towards Greenland and then swept across the North Atlantic by the upper air ridge, and will be building in Scandinavia at the start of next week. 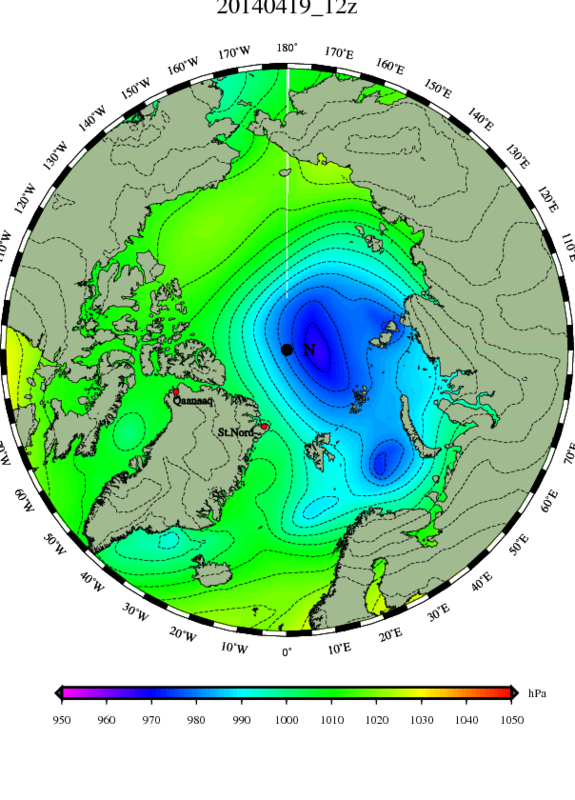 The low pressure over Scandinavia will move east along the Siberian coast and then be swung north by the low over the Pole and will do a Fugiwhara dance with it. In May we usually start to see our first pools of above-freezing air invading the Arctic Sea, but currently not even 24-hour sunshine can get it above freezing at the Pole. The sun is still relatively low. I can’t believe it! Despite the south wind it is once again 38 degrees ( +3 Celsius) as the wet, black night gives way to grey. The warm air has pushed as far north as the south shore of Boston and just east of Hartford, where it is in the 50’s, and up the Hudson Valley to make it 47 up in northern Vermont, but the cold hangs stubbornly in, close to the ground, and the warm front can’t push north. Often we see this, up here. By the time the warmth finally gets here the cold front is right on its heels, and what is a two day warm spell in Virginia lasts only two hours in New Hampshire. I’m worn out after having to attend one of those state-required adult-education classes last night, over in Keene towards the Vermont border. It was better than usual, as the teacher was my age and actually knew more than me. It really drives me mad when the teacher is less than half my age and doesn’t know diddlesquat, yet the state requires me to pay for the class. I was in the mood to be especially sarcastic, after scraping together $3254.46 to pay my property taxes, yesterday. I don’t much like paying stupid people to waste time and money being stupid, but had the pleasant surprise of meeting someone who had a heart and years of experience. The class was about caring for children younger than our Childcare cares for, and the wise woman admitted they really should be at home, but reality is what it is, and therefore Childcare needs to be the home they don’t have. (Infants spend longer hours at Childcare than their parents do at work.) It is upsetting to realize that in the rush of getting up and getting to work, and then collapsing after the long day, some homes don’t even offer the social experience of sitting around a table for a meal. The child learns about even such a fundamental thing at their Childcare. It is cold, wet and grey out, and my wife is under the weather with some sort of stomach-bug. Springtime continues on hold. When it finally comes I expect it to be a mad rush. Actually, once I got the wood stove going, I noted our winds are not from the south. The smoke drifted off to the southwest, which means the wind has gone back to light airs from the northeast. The cat went out onto the porch and just sat, looking around with a sulky expression of complete disgust. Yesterday even the goats looked depressed, which is unusual when the grass is just getting green after months of being brown or snow-covered. It gradually warmed as the sky brightened, until the warm front pushed through just before noon, and then it abruptly was warm and muggy. I was absurdly overdressed, and soon absurdly hot, considering it was only up around 70 (21 Celsius). I didn’t dare complain, though I wanted to. For one thing, the trees haven’t even started to bud out, and there isn’t a lick of shade. However it looks bad if you switch from complaining about it being too cold to complaining about it being too hot in four hours. It sets a bad example for the kids. About the only thing really green and growing is the grass, and I had the wisdom to beat the rush at the repair shop, and will be picking up my beat up, 25-year-old rider mower in the morning. I also have to think about tilling the garden, which is a bit of a swamp after the rain of the past week. Now it is a mild evening, with heat lightning like summer’s to the south. We’ve moved from March to May so quickly my head’s spinning. Of course the map shows this is just a tiny bit of a warm sector, with the cold front on its heels. 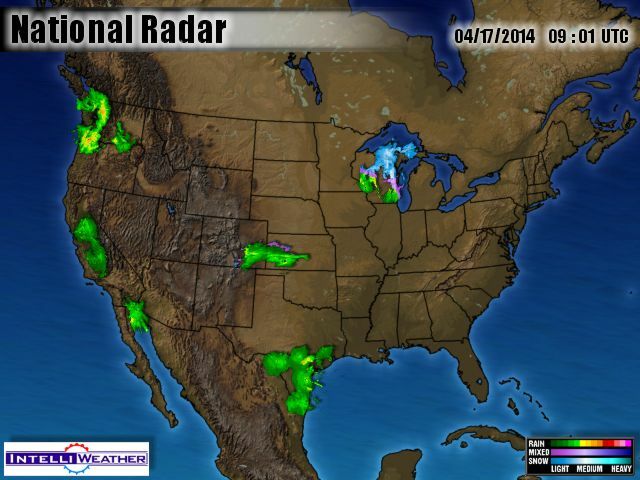 Plenty of chill to our west with the Great Lakes still 30% ice-covered, and snow in the high plains and Minnesota. And then there’s that fresh cold front dipping down in western Canada. My head may soon spin the other way. 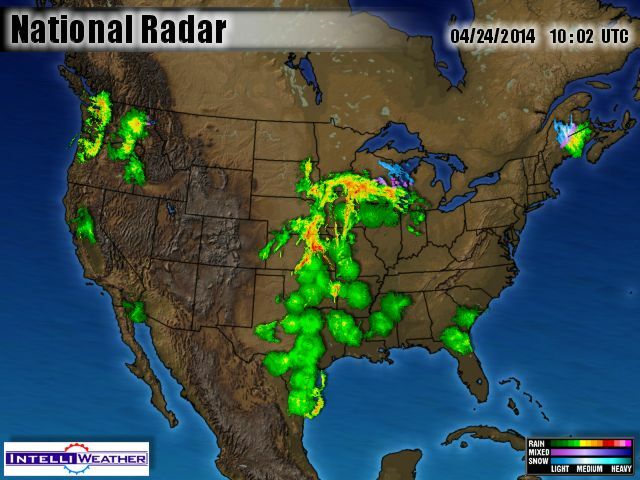 I like having the DMI maps in rapid succession like this. By scrolling down you can create a sort of animation, (if your mind works like mine), and see the progression of events. What I think I’ll do is devote posts to DMI maps and nothing else, while leaving them out of this series of posts. Not only will this series become less cluttered, but the DMI maps will better tell the story of the north when there are not a lot of other distractions. 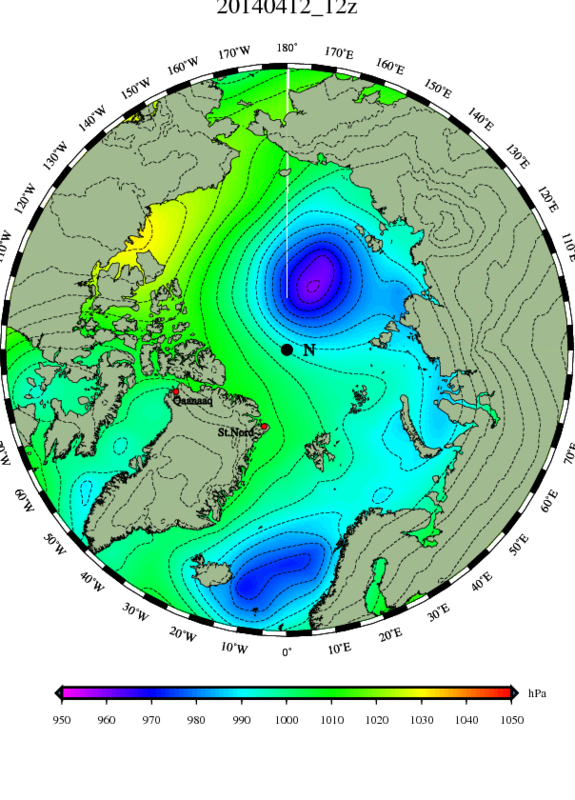 This particular series shows the polar low coming up from the Pacific. The last one came up from central Siberia, and the one before that came up from the north Atlantic. It gives you the sense the storm track is swinging around the Pole. The first above-freezing temperatures of the approaching summer are leaking through the Bering Strait, sucked behind the low I dub “Nutrak” (as it took a new track to the Pole). That mildness is “fuel” and will clash with cold air just west of Greenland, which is also being drawn north. 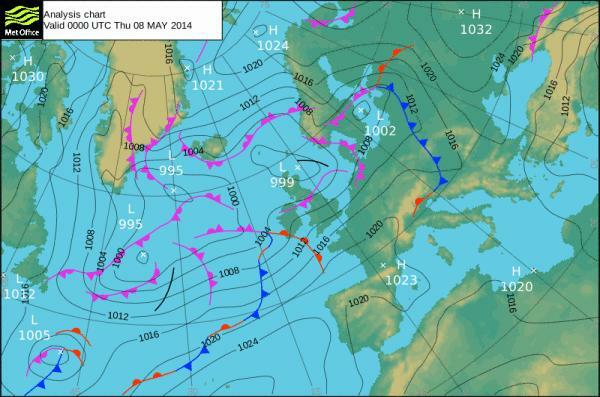 Meanwhile the Atlantic continues to be prevented from pouring air northwards. “Damper,” south of Iceland, may change things. “Nutrak” must be battering our polar hikers just as they get within a day’s hike of the Pole. I ought check up on them. The above picture is from April 30, before the weather started to deteriorate. They are crossing a small pressure ridge. 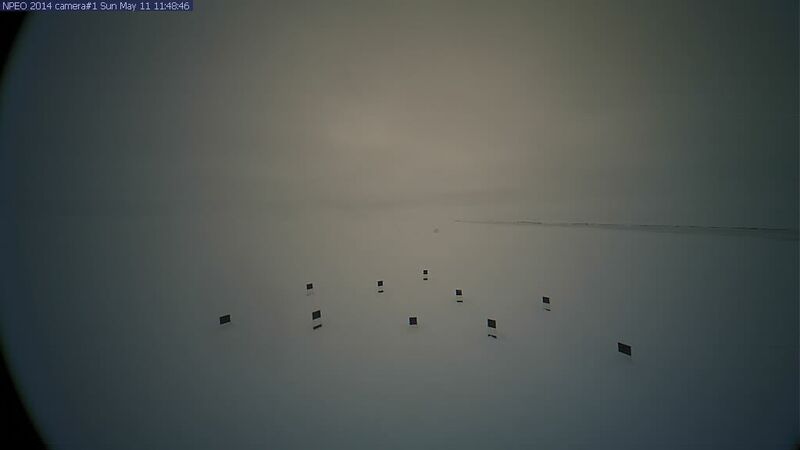 The North Pole Cameras are now showing grayer conditions. It’s hard to navigate without the sun. The winds are picking up and the ice may be moving as fast as they can walk. Let us hope it moves them towards the Pole and not away. They are nervous because they are apparently following in the footsteps of a large polar bear. Hopefully they wont catch up to it. Meanwhile, to the south where the weather is both milder and sunnier, the Canada-bound “Expedition Hope” is running into much larger pressure ridges, piled up against the northern shores of Canada. “Nutrak” is just starting to weaken, having used up his “gas.” However a new storm in the Bering Strait, (“Bear”), is going to be the next to mount a rush towards the Pole, this time coming from the Alaskan side of Bering Strait. 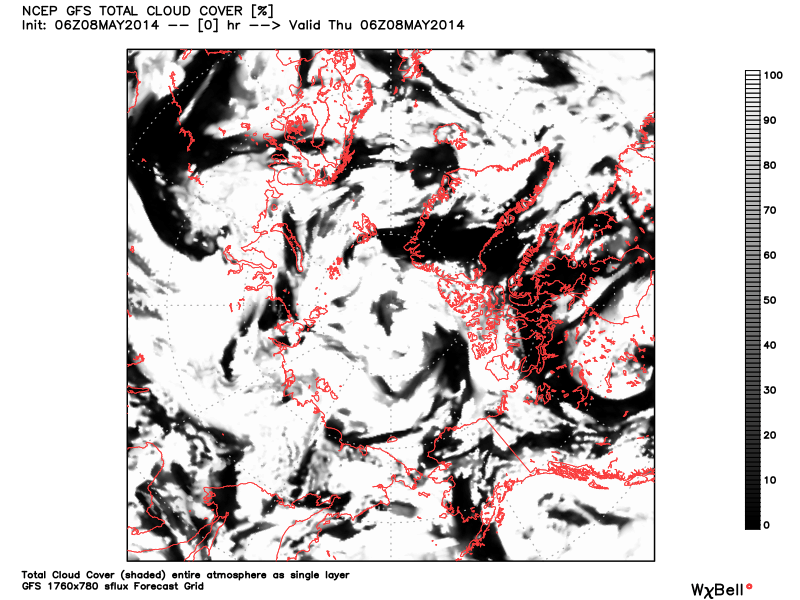 It looks like “Damper” south of Iceland will just sit there. 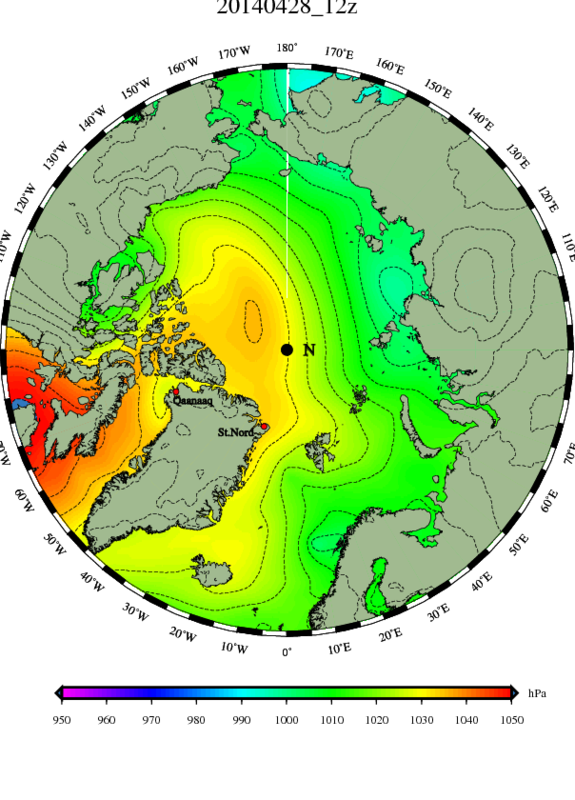 The high pressure in the North Atlantic won’t budge. However it will be centered over Svalbard, and in Fram Strait the winds will push up from the south, and the ice will flow the “wrong way” for a few days. This was something that happened a lot last summer, keeping a more ice up there than in recent years. It remains to be seen whether this is a fluke event this year, or the start of a “pattern”. Wrong-way-flow in Fram Strait. “Nutrak” is weaker, “Bear” is stronger. The cracks look small from outer space, but to even see them they have to be pretty wide. They can open and shut as the wind changes. I sure wouldn’t want to swim across one, but these crazy adventurers do swim across the narrow ones, wearing a “dry suit.” Here is a picture of a member of “Expedition Hope” doing exactly that, today. I’ve been laid low so I’m laying low. I caught a mild case of the bug my wife caught, but I had the good sense to wait for the weekend, and not miss any work. There may still be some ice in june: http://wattsupwiththat.com/2014/05/03/noaa-expert-lake-superior-may-have-ice-in-june/ So our west winds won’t be that warm. We need a long and steady southwest wind. I’ve got to get to work planting cold weather stuff. I’ll probably have less time to post. As “Bear moves towards Pole mild, above-freezing air is sucked north ahead of it. South winds in Fram Strait, but the invading air is not especially mild or “Atlantic” yet. Calmer, but grey and relatively featureless. 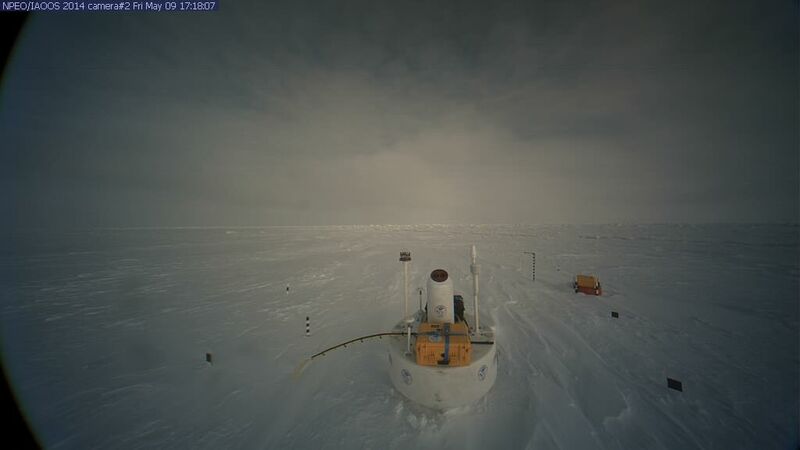 As Larsen and Waters approach the Pole they will have to rely on their GPS, as compasses wobble that far north, and there is no sunlight to get a bearing from. I assume the dark line on the horizon is now clouds, and not open water. Stewart Pid warned us of this, via the comments below this post. It has got to be a cold spring if even the snowmen are hitchhiking south, but it looks like the natives are handling the cold spring just fine. “Bear ” has become a decent gale north of Alaska, crunching ice the “wrong way” in the Baufort Gyre. 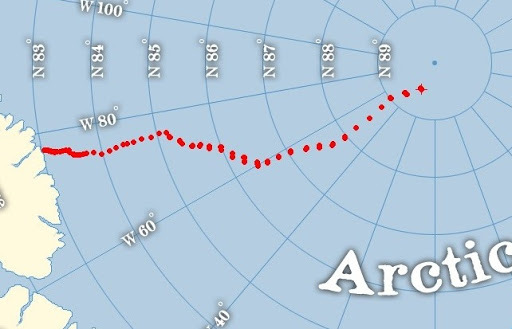 Wrong-way winds continue in Fram Strait. The North Atlantic isn’t quite so cold as it has been. They are thawing in Svalbard. “Bear” is likely at its height, however it likely will not weaken rapidly, and will retain strength as it creeps towards the Pole. I suppose the thing to hope for is that winds gently shift, and bring the spreading ice back together again. Gently. No crunching pressure ridges, please. And, while prayer might not be politically correct, they could use some. 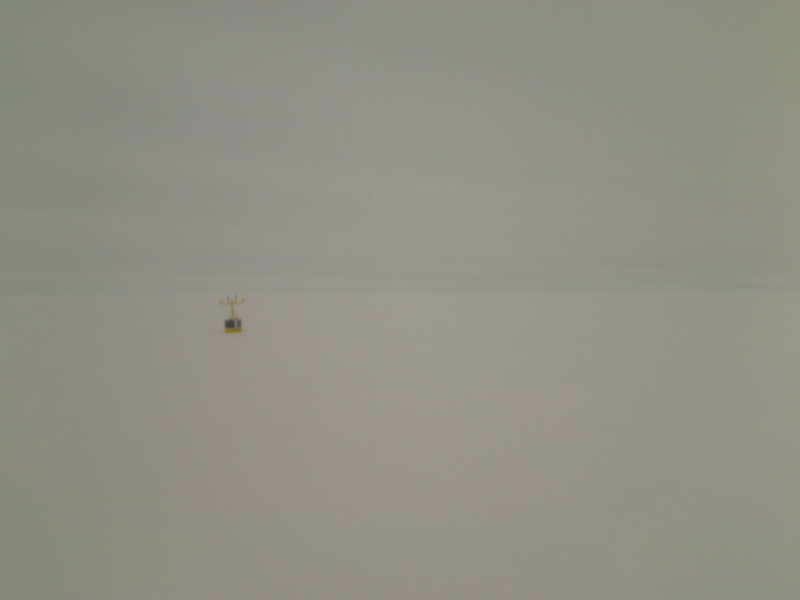 This camera has drifted south, and is roughly 100 miles south of them, toward Fram Strait. It was placed on ice especially chosen because it looked stable and unlikely to crack apart, which is why it looks different from the scene Larsen and Waters are describing. 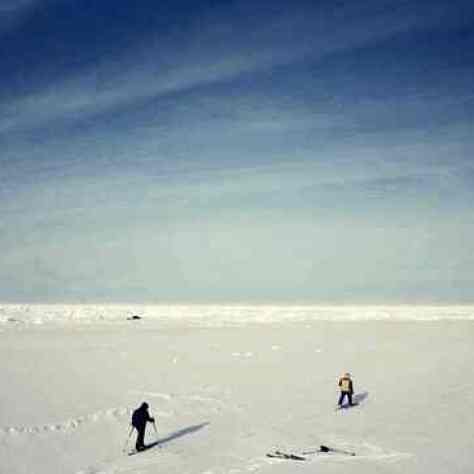 They had to swim in “dry suits” and clamber over crunched pressure ridges, before they found some lovely flat ice for their final stroll to the Pole. 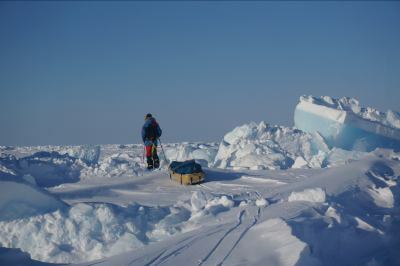 Now they have to keep an eye out for polar bears, as they sit back and drift with the ice, awaiting air transport home. This is quite different from Peary, who had to walk all the way back to land. However their exploit remains a feat of amazing stamina and endurance, and amazes me. Now, however, I expect they will feel compelled to do a bit of blathering about Global Warming. 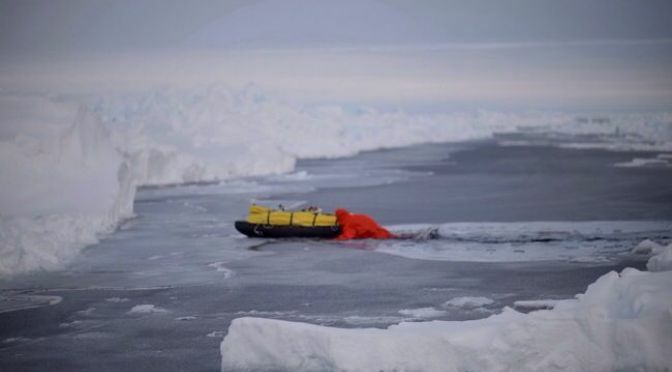 To forestall future discussion, I suppose I could drag up pictures of submarines surfacing in open leads at the North Pole in the past, even earlier in the spring. I could also point out the meridianal pattern has sent three storms up to the Pole in thirty days, and a fourth is upon them even as I speak. It is no wonder the ice is stressed, and full of leads and pressure ridges. Their journey was far more difficult than it would have been in a more quiet and zonal pattern, where the ice would have been nice and flat. 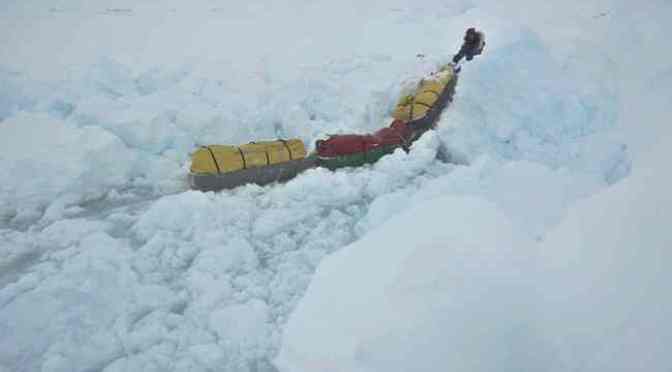 They deserve credit for the prowess they displayed, overcoming a tortured icecap, but may earn themselves a debit if they prattle on too much about Global Warming. 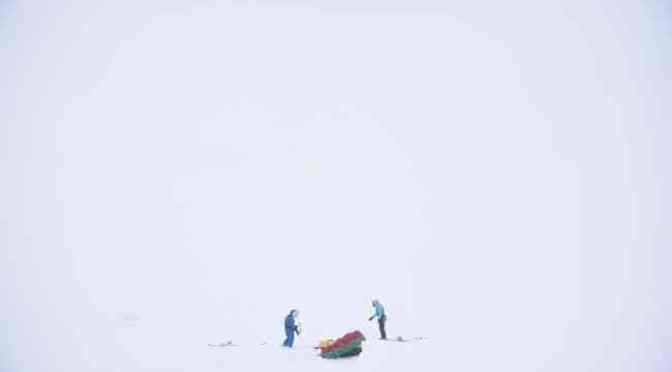 Meanwhile the three adventurers in “Expedition Hope” are running into some pressure ridges that suggest the icecap isn’t exactly melting. In a full day’s hiking they covered only 3 km. 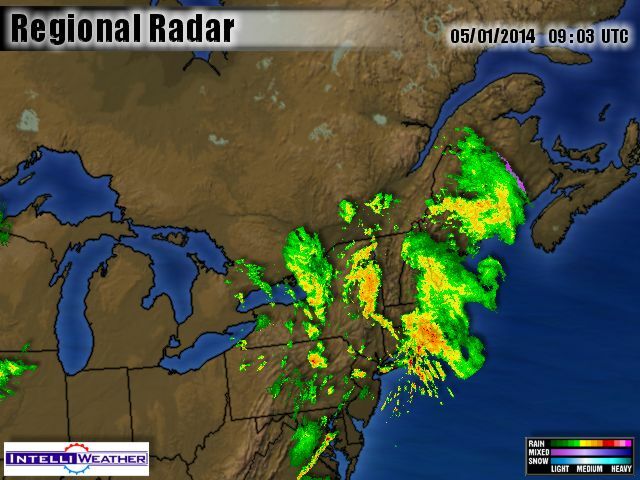 The storm I dubbed “Bear” is weakening as it nudges towards the Pole. While it is not as strong as the gale of April 13 it is creating a “wrong-way” flow in the Beufort Gyre, and also sucking a “wrong-way” south wind up through Fram Strait. I imagine this further crunches and tortures the ice up there. It is still just barely cold enough for open water to be chilled, but the salt water is at roughly -1.7 degrees Celsius, and as the air warms up above -5 degrees Celsius the chilling wont be as great, and the leads will be slower to freeze over. We have a ways to go, however, before actual melting starts. 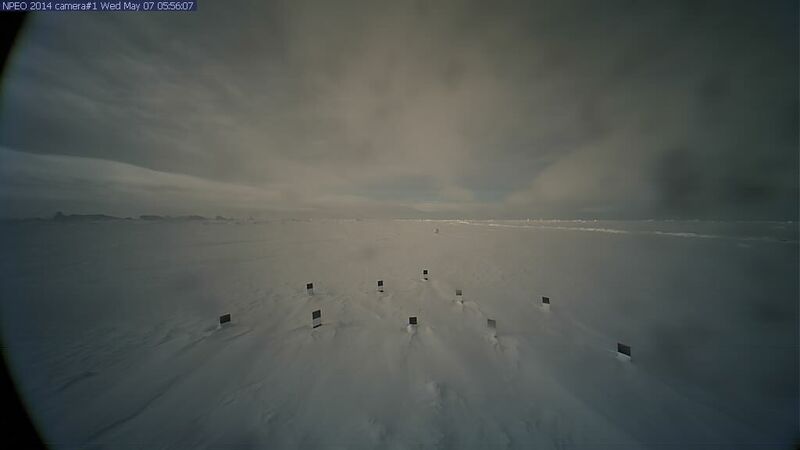 Remember these cameras have drifted nearly down to 87 degrees north latitude, and the view is over 150 miles from what Larson and Waters are seeing at the Pole. Is that a new crack in the Camera One shot, stretching from the central left margin to the central horizon? 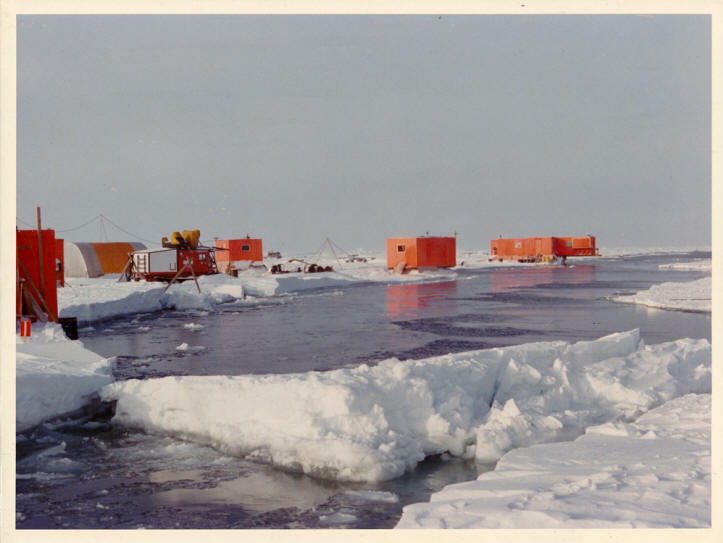 Here are some pictures taken by (or owned by) Rolf Bjornert of the Arctic Ice Dynamics Joint Experiment (AIDJEX) in 1975. 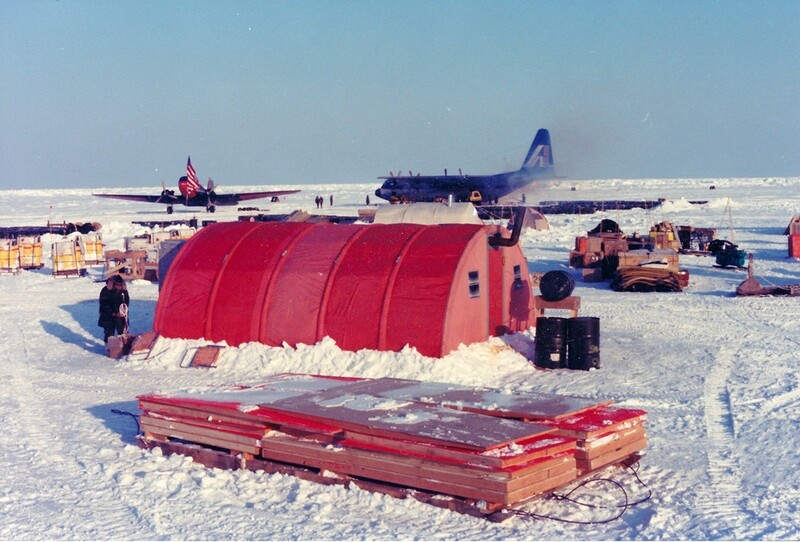 The first is of setting up camp or resupplying the camp, perhaps as early as March 13, 1975, though I judge the photo to be later due to the angle of the sunshine. The aircraft are identified as “an Alaska International Airways C 130 Hercules and a USN R4-D (in civilian terms called DC-3). 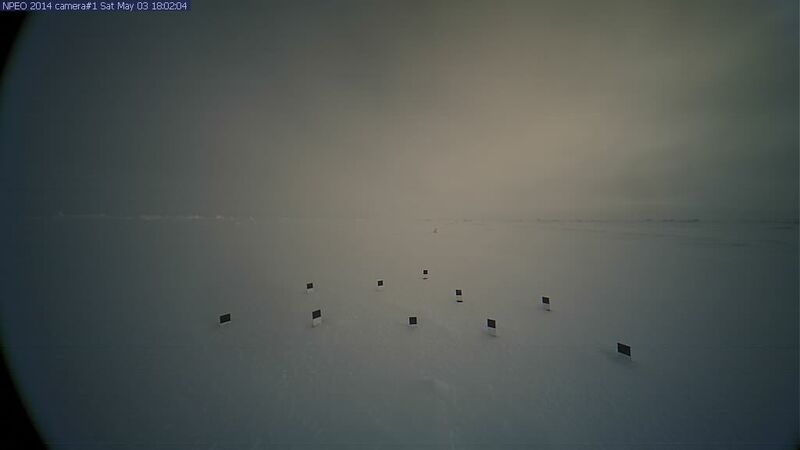 The second picture was taken as the ice broke up right under the feet of the scientists at the main base in September. Amazingly, they simply packed things up and moved 40 miles away and went on with their work. 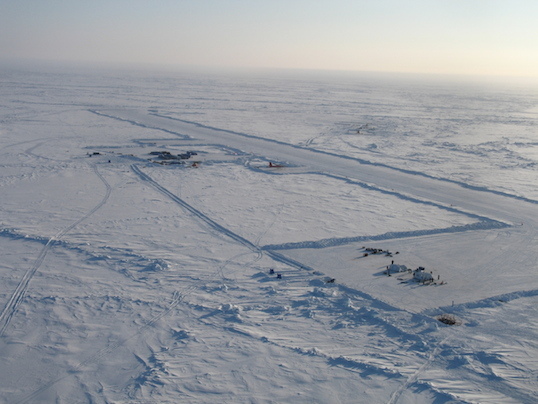 Scientists (and the military) also built bases on “ice-islands” such as the one called “T-3”. My best guess about the formation of such 100+ feet thick bergs is that they are formed by glaciers that pour ice slowly out into the Arctic Sea on the north coast of Ellesmere Island. This ice forms an ice shelf that expands during the “cold” AMO and especially during cold periods such as the Little Ice Age, and contract during the “warm” AMO and especially during warm periods such as the Medieval Warm Period. It is during warming periods that the huge “ice islands” shelve off. 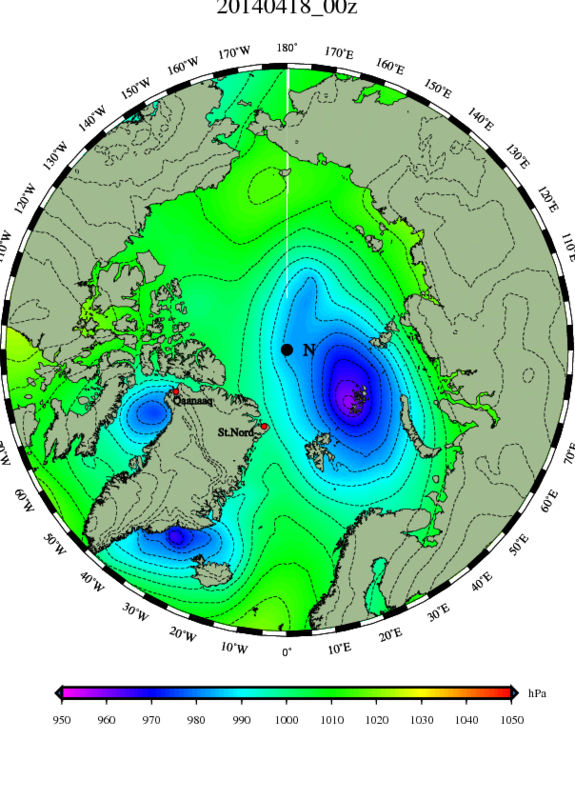 Although not all that strong, “Bear” will persist over the Pole through Saturday. Milder air is leaking north over Svalbard. The Canadian and Alaskan coast is warmer than normal as the Siberian coast is colder than normal, and some of that cold air is working back towards Finland on east winds. 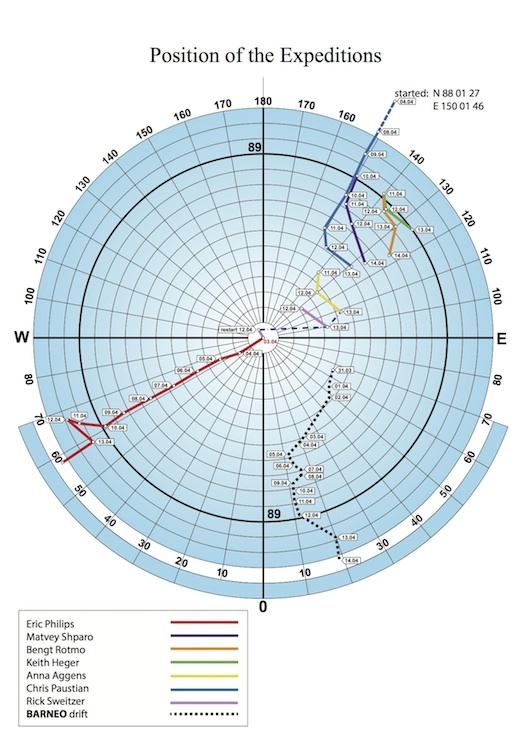 An interesting one of the thousand-maps Dr, Ryan Maue makes available at the WeatherBELL site shows polar cloud cover, and that “Bear” has a weak “eye” at the center. 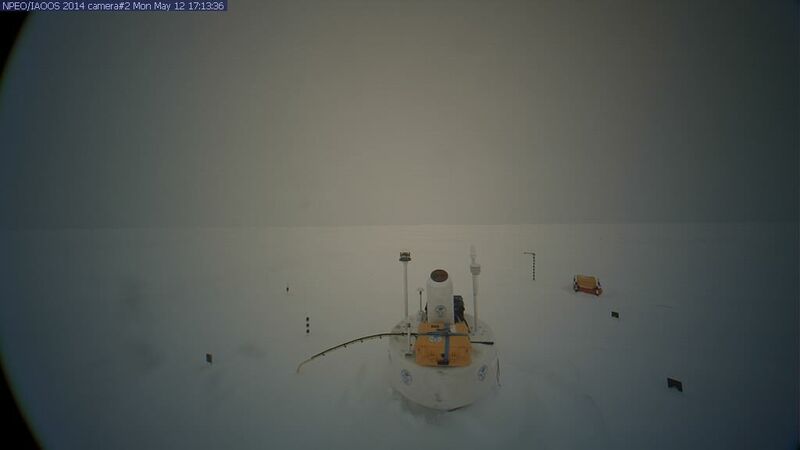 A THIRD NORTH POLE CAMERA? I think the third just appeared today, as I never saw it there before. 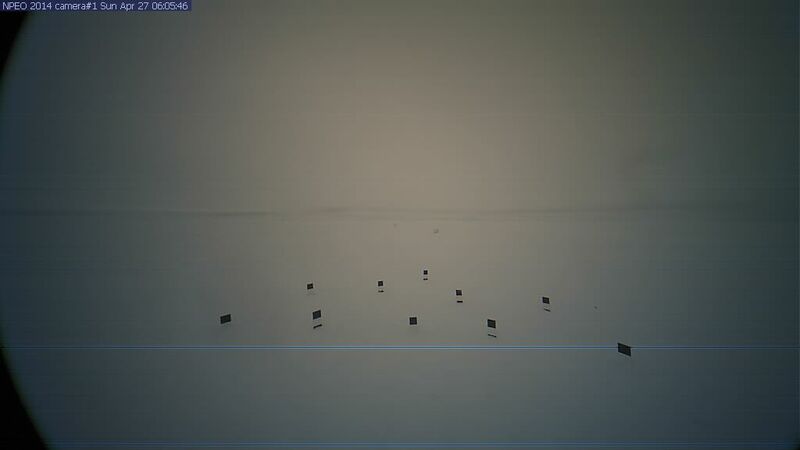 They may be just working out the bugs, because the picture in the archives of Camera 3 dated May 8 is dated April 14 on the picture itself, and seems to show the guys setting up the camera back then. I suppose they’ll get it all straightened out with time. The whirling mess of occluded fragments of storms persists south of Iceland, though it has kicked an eastern extension into the Baltic. (I think the original storms were named “Wendy” and “Damper” with a secondary of “Torn,” “Tornson,” now appearing at the lower left.) For the most part milder Atlantic air has been prevented from moving north, though some did sneak up the east coast of Greenland and over Svalbard for a bit. Tornson looks likely to move east across the Atlantic to England in three days, as the blocking pattern weakens for at least a while. “Bear” is drifting off the Pole towards Eurasia. Some milder Pacific air is being drawn in through Bering Strait and along the coast of Alaska, but it is like there is a lid on the top of the North Atlantic, and no full-fledged invasions of mild air are coming north. “Bear” retains strength towards Siberia. 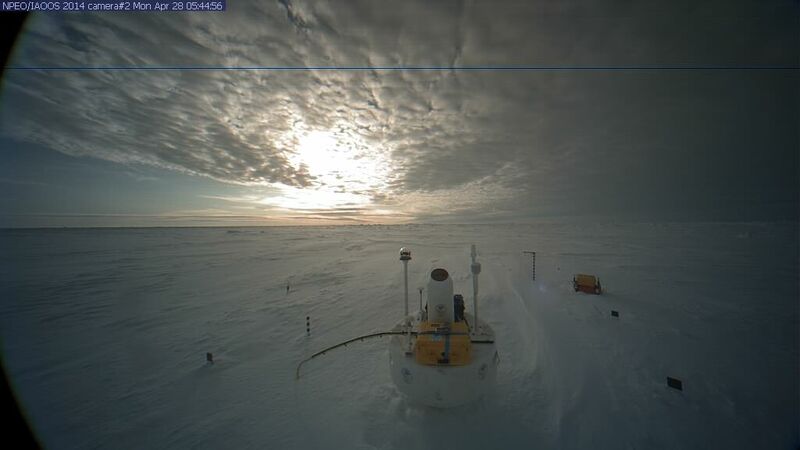 I imagine the cloud-cover associated reflects a lot of the low sunlight, keeping the Pole cold. There are no above freezing temperatures on the Arctic Sea. We have a long way to go to reach the heat of July, when temperatures right on the arctic coastlines can top 70 degrees (21 Celsius). It looks like “Bear” decided against a visit to Siberia, and after visiting Severnaya Zemlya (those islands to its south) it is swinging north past the Pole towards Greenland, right over our North Pole Camera and then weakening down in Fram Strait. 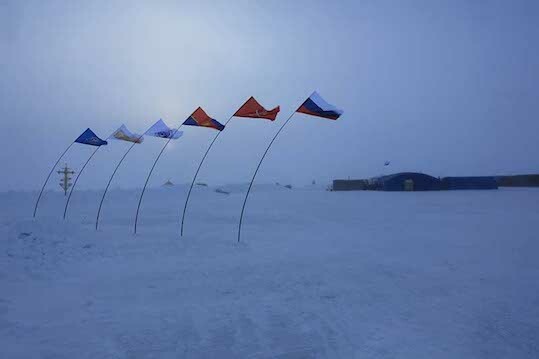 Winds on the Greenland side of “Bear” are quite strong, despite the weakening of the storm. While a new cross-polar-flow is suggested by isobars, from Bering Strait to Fram Strait, it looks like the winds to the north of Fram Strait will be from the west in the short term, blowing sea-ice to the east rather than south into the Strait. Noon is at the top of the temperature map with midnight at the bottom, and you can notice day has warmed temperatures off the north coast of Alaska, as night cools temperatures off the coast of Norway. As the high pressure block breaks down weak low pressure is forecast to drift north from the Baltic Sea to the Siberian coast east of Finland, and restart the more normal progression of lows from west to east along that coast. The storm track likely will back up across Scandinavia, and eventually Atlantic lows will ripple east to the northwest of Norway on their way to the Siberian coastline. For a time storms have just been stalling out in the Atlantic, forming a confused soup of occlusions. Rather than being stirred into that soup, it looks like “Tornson” will be the first low in a long time to run along the southern edge right across the Atlantic. Because the southern edge has extended into the Baltic, “Tornson” will swing through the Baltic, and then across Finland up to the Siberian coast. It has been a real struggle to get any warm Atlantic air up into the North Atlantic or Scandinavia. Last winter the warm front currently just touching England would have lifted warm air from the Azores right up to Norway, but now it will head east, south of Denmark, and if the warm sector doesn’t completely occlude it will only poke north to the east of the Baltic. Ar times it seems mild air over the Black Sea has a better chance of working back to Scandinavia than air from the Azores does. Temperatures are well below freezing as this picture is taken.  ( -10.7°C at noon yesterday.) I assume the “fog” we are seeing is actually falling snow. The buoy has drifted south of 87 degrees latitude, moving south-southeast in the steady 15 mph winds. At noon yesterday it was at 86.990°N 13.439°E, which is further east than we ever got last year. “Expedition Hope” heard the plane pass over, and knew Waters and Larsen were going where it is safe and warm, as they struggle to cross pressure ridges like mountain ranges separated by leads choked with ice. If you go to the “Blog” tab at the top you can access Bernice’s running comments, as well as the comments of Eric Phillips and Martin R. Hartley, who struggle south beside her. 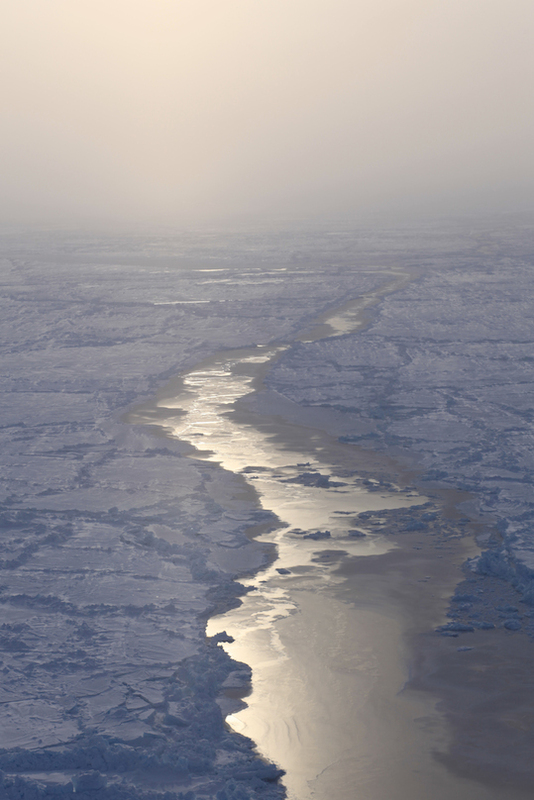 Their first-hand accounts of crossing some of the thickest ice seen in recent years seems to belie the talk of the Pole melting. “Sastrugi” are the long straight drifts that form over the arctic sea-ice when the wind stays in one direction for a period of time. Adventurers prefer to ski with them and not across them. 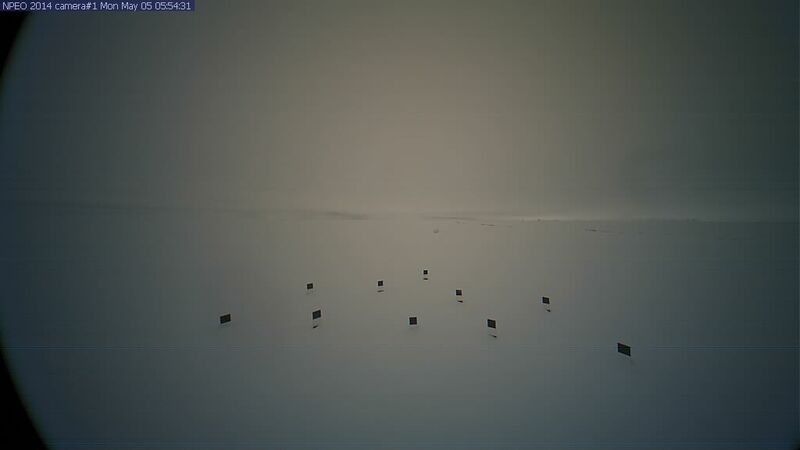 One interesting thing about their formation is that besides drifting ice it involves drifting salt. The above picture was taken roughly six hours after the Camera One picture further above. Looks like the weather is clearing, even as “Bear” approaches. The lead of open water to the left looks like it either closed, or else froze over and was dusted by snow. Above freezing temperatures at noontime are oozing in through Bering Strait, and part of a Pacific-to-Atlantic cross-polar-flow. The lead to the right has clearly frozen over and been dusted by snow. The drifts are shifting. Obviously it has been windy and well below freezing. Isobars indicate north winds in the North Atlantic. Little warmth coming up from the south on the Atlantic side. Even the surface water is being shunted south. Results from Buoy 2013G: indicate temperatures of -2.39 C and results from Buoy 2014B: show a temperature of -2.78 C, over towards Alaska in the Beaufort Sea. These are the mildest readings I could find. 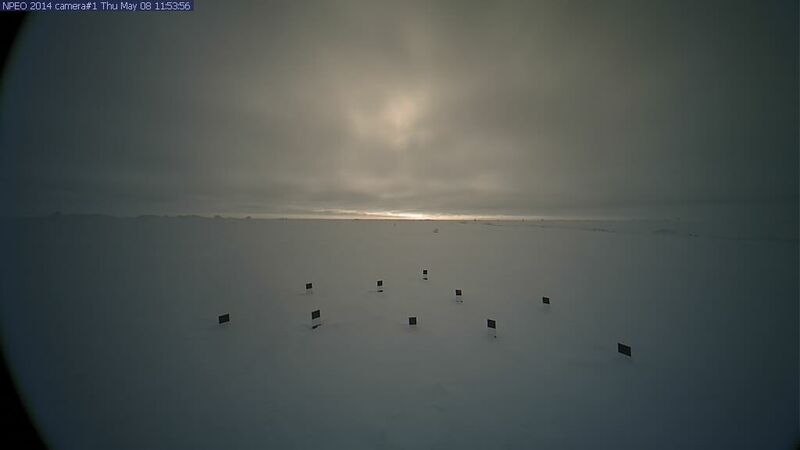 You can’t really call it “a midnight sun” at noon, especially when the remains of “Bear” make things this gray and cloudy. 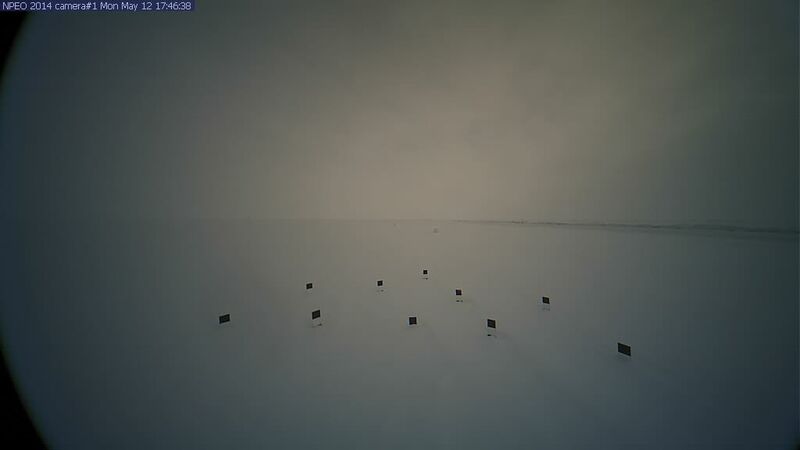 However you can see it never gets dark, even though our cameras had already drifted down to 86.779°N, 11.654°E at noon today. Temperatures rose as high as -8.8°C at 1500z yesterday, but then dropped back down to -11.2°C at 0900z today. I suppose it can’t warm much if the sun doesn’t shine, unless the wind is strong from the south. There seems to be a strong breeze of 18 mph from the north. The first map shows May 5, right after a shot of cold air pushed south a week ago, (the same air that gave snow to Calgary), so I figured we’d have a cool day or two before the high to our south started to swing warmer air up its west side. And it did start to do that, hitting somewhere out west and delighting the Global Warming crowd, as in one place it was the earliest it ever hit 100. But the heat didn’t hurry north. 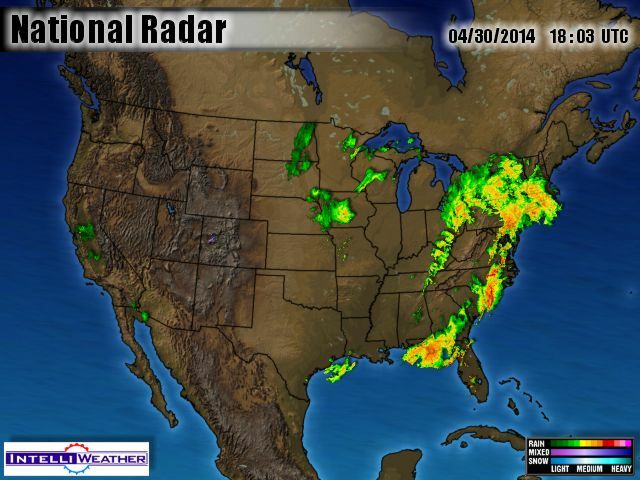 The next map is from May 9, and you’ll notice the front is still stuck in Pennsylvania. 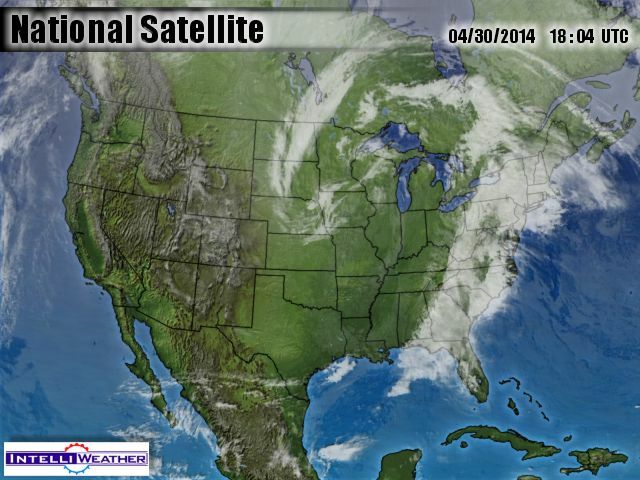 What’s move, the winds in front of the front are from the east, off the cold Atlantic. It is grey and gloomy and, rather than temperatures springing upwards in the bright sunshine like a desert’s, they sulked in the upper 40’s (9 Celsius) at the warmest part of the day, before cowering back to 40 after dark. The next map is from May 10, and surprise, surprise. The front is still stuck in Pennsylvania. However the wind swung around to the southeast and then south during the day, and abruptly it was muggy and warm, and thunderstorms rolled by ten miles to our south, (where the front “officially” made it to, on a later map, though the air sure felt like the warm front made it past us, for an afternoon at least. And then the cold front pushed through, giving us today’s map, which is similar to the map back on May 5, though the air is not quite as cold. Once again cold air is charging south in the west. 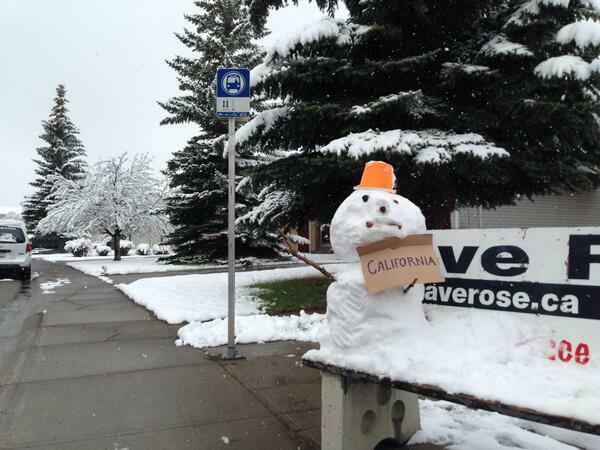 (It is snowing in Denver.) Once again a surge of warm air is rushing north in the middle of the USA. Once again a warm front is setting up to our south, but I’m distrustful and bitter. My cynicsm mutters that if any warmth gets up here it will last around three hours. Simply looking at my back porch thermometer I usually see the coldest temperatures just at dawn, however when it is clear at sunset and cloudy at dawn, especially when a warm front is approaching, the coldest temperature may be right after sunset, which is “yesterday” and not “today.” If I use the overnight low to determine “today’s” mean temperature in such a case, my numbers are not fully accurate. A further problem is that there are all sorts of other things that can screw up my measure of how cold or warm it has been. This past winter I noticed the warm sector of storms might pass over in a matter of a few hours, spiking temperatures up with the warm front and crashing them down with the cold front, yet on one occasion, because it happened between ten PM and two AM, it straddled midnight, and therefore a warmth that lasted only 4 hours gave me my high temperatures for two days. 4 hours of mild breezes trumped 44 hours of bone-chilling cold, or at least altered the mean upwards. What it didn’t alter was the frozen slush on my driveway. Because the warm sector only lasted, in one case, 90 minutes, the ice really didn’t have time to thaw before it was freezing again. That frozen slush, with an IQ of zero, knew something that I, with all the data from my back porch thermometer, didn’t. This was particularly obvious last winter because warm-sectors had a hard time budging the cold air over New Hampshire, and when they finally rushed past a cold front usually was right on their heels. When this happened fifteen times during the course of a winter it meant there were fifteen occasions when my back-porch mean temperatures were uplifted, even as the frozen slush on my driveway told me it had stayed cold. There are times when the official statistics tell me one thing, but my frozen farm pond, or the refusal of trees to bud in the spring, and many other things I witness outdoors and call “signs”, are telling me something quite different. What should I trust? Numbers on a sheet of paper? Or the reality I am amidst? What should I be concerned more about? A 0.05 degree adjustment some geek sneaks into a spreadsheet? Or a cold west wind from still-frozen Great Lakes? No one picked up my idea, and instead the discussion remained about how to read a thermometer, but I really have noticed a difference in the trees this spring. I can never remember them being so slow to bud, and then, when they do bloom, the blooms seem sort of withered and limp. Spring isn’t “busting out” like it usually does, Also there is a definite and very regional difference in the time things start budding. The farm is less than a mile away, and only a hundred feet (at most) higher than my house, but more exposed to north winds, as my house is tucked into a sheltering hillside and faces southeast. The maples are just blooming at the farm, while the leaves are coming out here. Another odd thing I noticed was that a single top bough of an oak was starting to open its buds at the farm, a hundred feet from a maple that was also just budding. Usually oaks are two weeks later than maples. On may 9-10, 1977 there was a freak snowstorm here and down in Massachusetts that I remember well, because, when I went back to my boyhood neighborhood, many of the trees I climbed and built tree-houses in as a boy (and therefore was particularly fond of), had lost important branches, and in one case all of its branches. The tree damage was so severe because the leaves were all the way out in 1977. Not so this year. I can’t help but wonder if the trees know something I don’t. 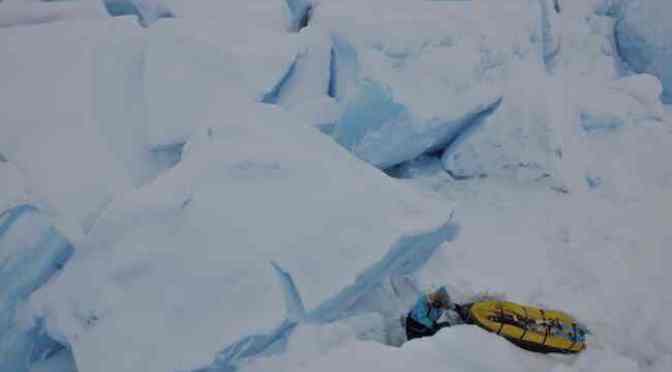 (By Correne Coetzer) Solo Norwegian skier, Bengt Rotmo has opted for an evacuation from the ice as Kenn Borek Air has decided to close down the season’s flights over the Arctic Ocean on May 12, his home team manager, Lars Ebbesen, told ExplorersWeb. Ebbesen added, after the decision was made yesterday, ironicaly the drift changed and Bengt gained a few miles during the night. The past two days Bengt had the worst weather since the start. Yesterday he had to stop early as he was worried if he would be able to get his tent up. Today he stopped to wait for better conditions. Closer to land more bad ice and open water awaits and therefore he wants to play safe and get off the ice. ExplorersWeb is still waiting for a response from Eric Philips, Bernice Notenboom and Martin Hartley, and their home team about what they have decided. Bernice Notenboom reports: We have entered the dramatic zone that the Canadian Arctic Survey calls “trouble”. “Bear” is being absorbed by “Balt”, which is drifting east along the shores of the Kara Sea. A weak low is developing towards Alaska from the Pole, and drifting towards Baffin Bay, (and making things uncomfortable for the three adventurers in “Expedition Hope”). 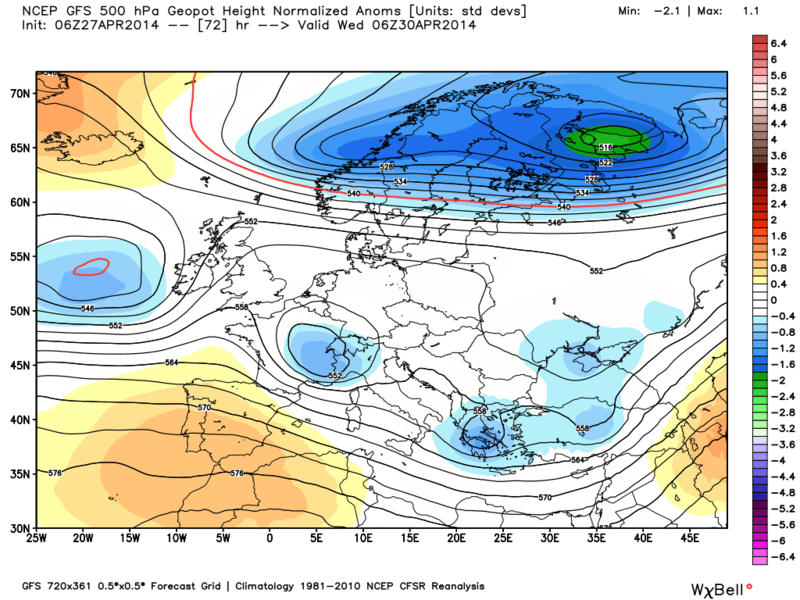 For a while weak lows will drift around a vauge center of high pressure over the Pole, however it is already looking like “Balt” will be followed out of the Baltic Sea by “Tornson,” and they may combine to generate a decent storm over the Laptev Sea over the weekend, and push yet another storm up over the Pole by the middle of next week. Of course, thats a long ways away, and one can’t trust computer models that far into the mists of the future. High pressure over Canada is drawing mild air north over Alaska, and Buoy 2013F: is currently reporting +0.02°C, which is our first hint of the summer thaw. (Some other buoys reported above freezing temperatures earlier over there. Here is a map of how Buoy 2013F has been drifting, followed by a rather dull picture of what it is currently viewing. You can click these pictures to enlarge them, or on some computers you can right-click them and open them to a new tab, which keeps you from losing your spot in my fascinating text. 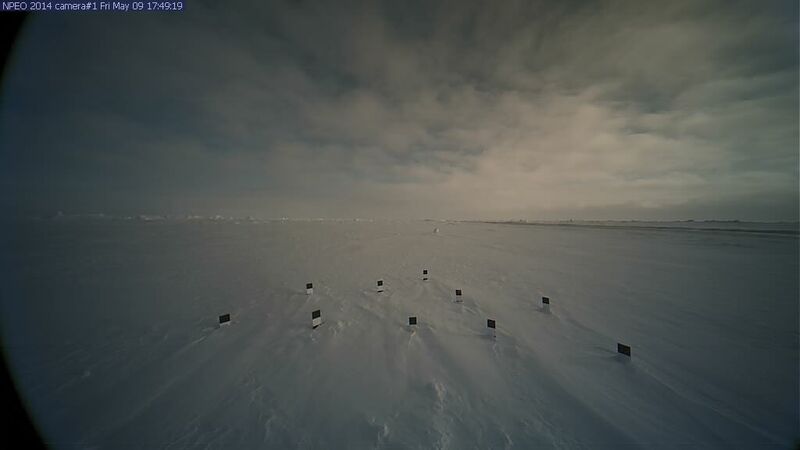 These buoys have drifted down to 86.698°N, 10.544°E as temperatures have risen to -8.6°C, which is roughly normal for this time of year. I’m not sure this much cloud cover is normal. 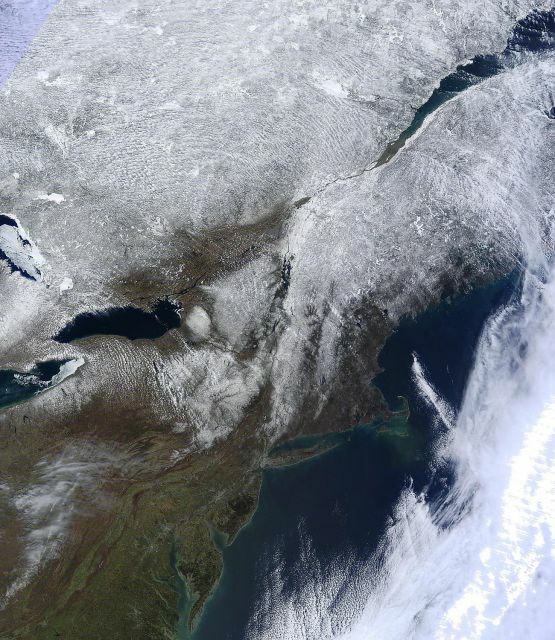 I’m wondering how much the clouds protect the ice, and especially any open water, from warming. I am really going to miss the superb photographs this trio has been sending back from the Pole, however the pilot who is suppose to fly them out has pretty much made up the young adventurer’s minds for them. He has flow to and fro over the ice all spring, and knows how smashed and bashed up it is. 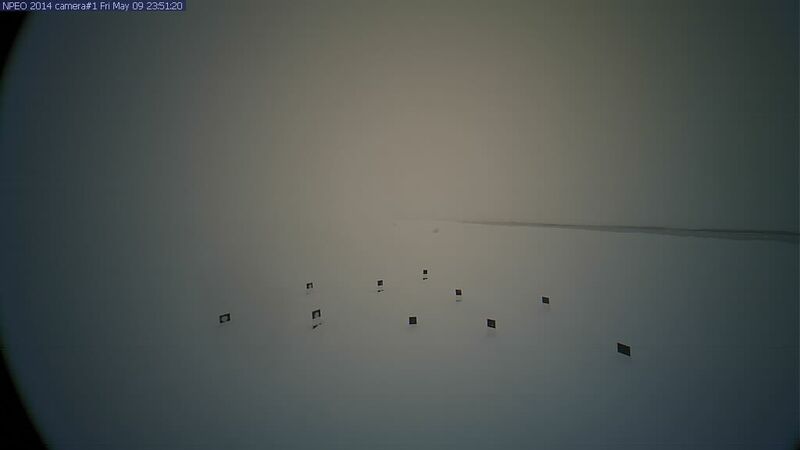 Also, (though no one has said this,) there has been more snow than usual, and can snow can hide weaknesses in the ice and make an unsafe floe of ice look safe. 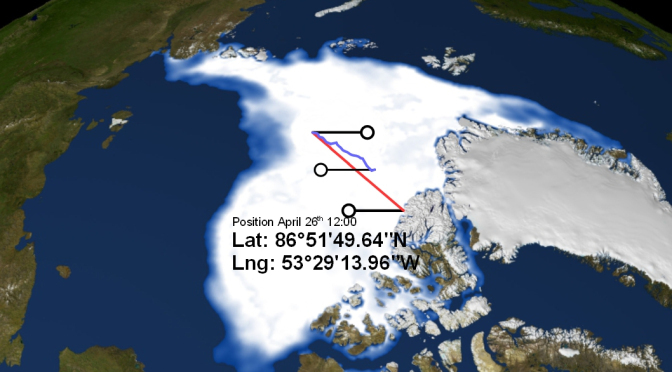 Lastly, the further south this trio proceeds the more jumbled and cracked the ice is likely to get, and safe “pans” of ice are likely to become fewer and farther between. 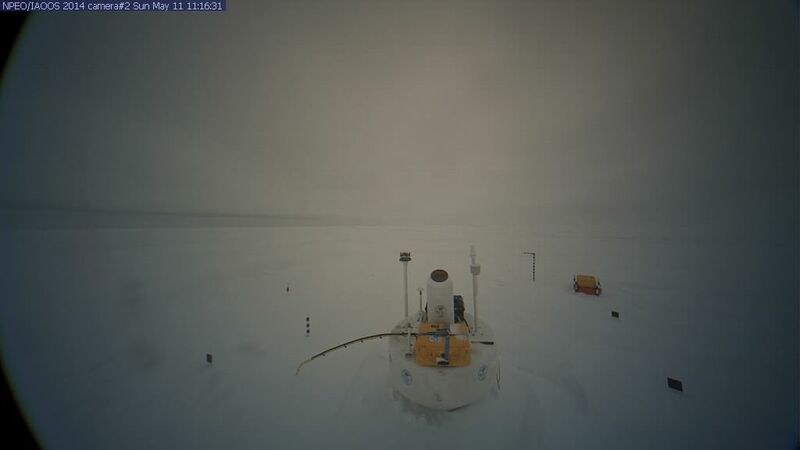 In any case, the pilot has drawn the line, and stated he will not land on the ice in June as he has done in the past, and in fact will make his last landing today, on May 12, weather permitting. I imagine he’ll break his own rule, as the weather isn’t permitting a landing today. However “Expedition Hope” has no hope of reaching Canada on foot. They may give us a few more good photographs, as they head south waiting for the weather to improve. 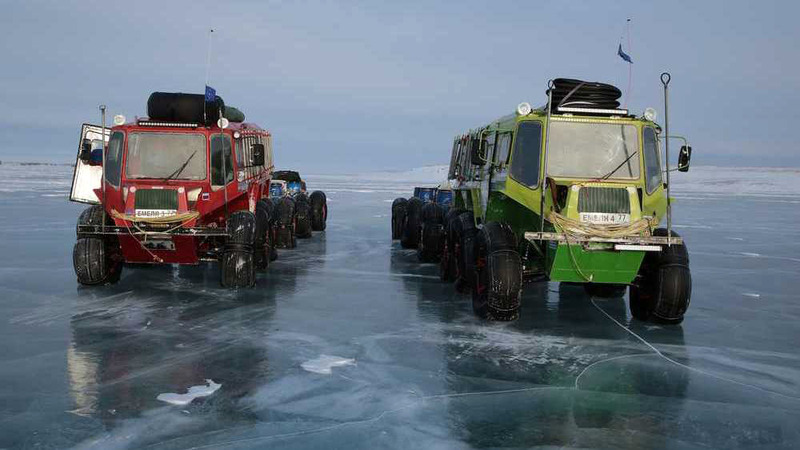 For the pilot’s sake, I hope they find a good, flat stretch of ice and stay there, and for their own sake I hope they don’t try anything too foolish. They also could likely use the prayers of those so inclined. 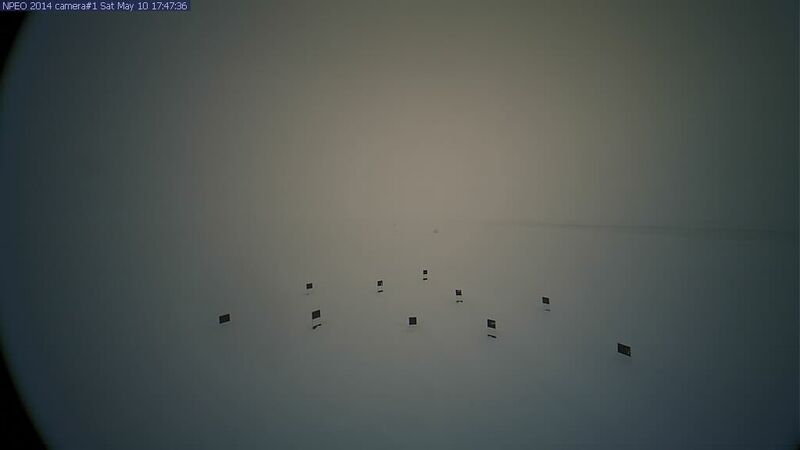 The best thing these crazy young whippersnappers do is to give us a far clearer picture of the situation up there than the static cameras can do. 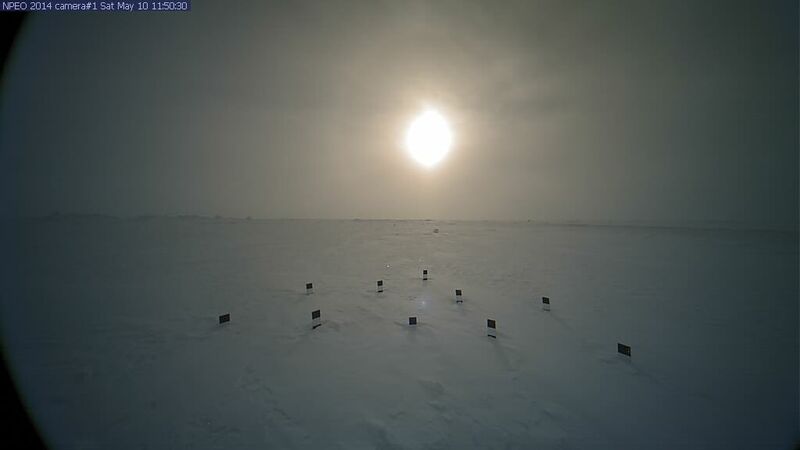 Of course, Alarmists and Skeptics are perfectly capable of looking at the same picture and arriving at vastly different conclusions, but at least we have these pictures, which brings light to the subject. Now, I am not going to editorialize. I am not going to say such people have more money than brains. I am not going to say that, if they are going to spend more on a hike than I make in a decade, I could show them some darn fine mid-winter hikes in my neck of the woods. I am not going to say such sums would be better spent on supporting my poetry. That would be in bad taste, especially as I get such joy from the views of sea-ice they share. There are also the more suicidal adventurous sort who ski with sleds. Here’s a day in their life…or maybe a second that felt like a day. This site “explorerweb.com” site eventually asks you to pay a few bucks to keep viewing, but it seems well worth it to me. I just don’t happen to have a few bucks today, but as soon as I do I think I’ll sign up. It is hard to call the wealthy men and women adventuring on the Pole “fat cats” considering they are testing the limits of human stamina, but the fact of the matter is that with a cell phone call they can arrange a rescue by helicopter. Another fact is that the helicopter may arrive too late. The sea-ice they are traversing is by no means stable and static, and can buckle and heave into a jumble right under their feet, or dissolve to a dotted ocean of stray bergs. They do have guts. I tip my hat to the lunatics for that. But mostly I thank them for the actual data they constantly send back about the sea-ice thickness, and its motion. When they bed down each “night” the motion of the ice may move them miles the right way, towards their goal, or miles the wrong way, away from their goal until they must feel they are running up a down escalator. I suppose a true scientist would ignore the humanity involved, and focus only on the drift of the ice. And I do focus on such things. However, (when no one is looking), I privately pray the lunatics will stay safe. Considering we have been told that “Our children are not going to know what snow looks like” and, “The North Pole is in a death spiral,” it seems humorous that as Americans fret themselves into a tizzy the Russians calmly fly “children,” (likely teenagers) up to the Pole by jet, and show them the wonders of that world. 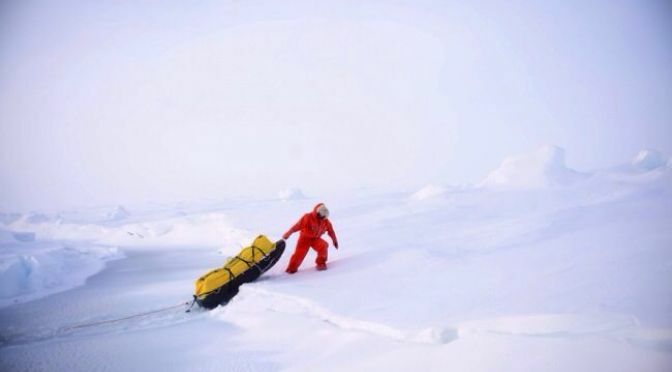 This year the expedition of young explorers was battered by two blizzards. It is hard to grasp the entire situation through translations, but apparently the Russians have been bringing groups of children up to the Pole for several years. This year, perhaps due to the storms, the adult supervising the “children” became anxious about shortages. As this person was “tweeting” his concerns on his twitter account, the concerns drew attention and many became concerned. In the evening, the expedition leader, Borneo 2014 Alexander Orlov who is in Longyearbyen, called from Moscow AN Chilingarov He reported that the North Pole from the group Matthew Shparo that comes with 7 teenagers and Pavel Astakhov route “last degree”, I received a call that the group is in danger – in blizzard conditions they run out of fuel, and of the products was only a meal. It was very surprising, because the base Barneo expedition leader Victor Serov ezhevecherne keeps in touch with all groups on the route. From anyone today no complaints. Nevertheless, having received from the Special Representative of the President of the Arctic and Antarctic mission to evacuate from the pole in distress children, Victor Serov was ready to lift helicopters. 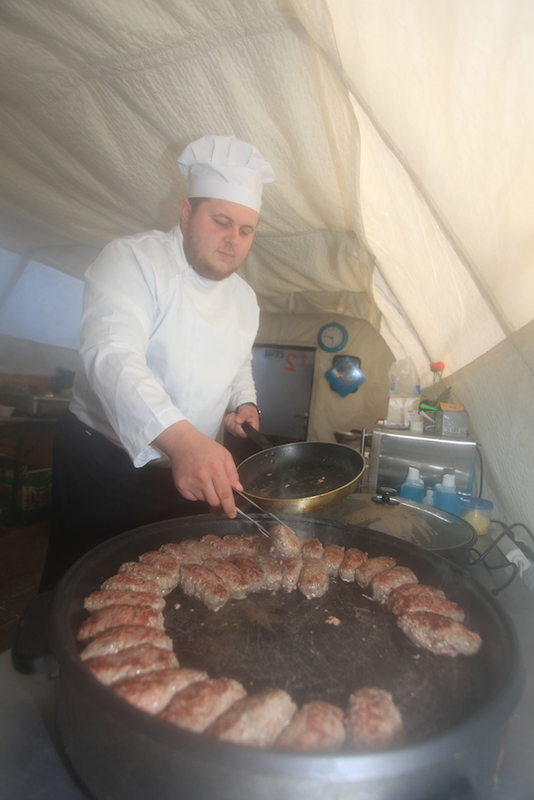 As a result of telephone conversations with youth expedition leader Dmitry Shparo revealed that a group of children already at the North Pole, all healthy and happy, is currently busy baking Easter cakes, they have enough food, fuel for heating tents too. Also located at the next hummock group Bengt Rotmo, which also sleeps on pole ahead of tomorrow helicopter. Nothing critical happens, so Dmitry Shparo apologized for the false information that someone gave to the mainland, asked not to worry, but to wait for tomorrow PLANNED evacuation adolescents with pole. He personally fly to take a group of journalists. Thank God that the situation is resolved in such a way – like the false “heroism” in the Arctic could lead to serious consequences. 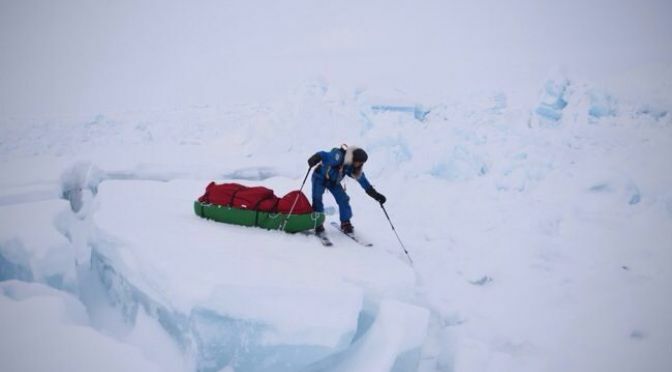 On April 20 I read: Just as directed by the Special Representative of the RF President Chilingarova AN was evacuated from the North Pole youth team Matvey Shparo. Children and their accompanying adults are already delivered to Borneo.This happened in spite of the original scenario – Head Dmitry Shparo had to fly them to the North Pole with a group of journalists. Yesterday we reported that Dmitry and Matvey Shparo not see the need for emergency rescue flight. But team member Pavel Astakhov different opinion – he continues to Twitter to insist that there is no product, no fuel and therefore need urgent evacuation. Now children are based, warm and well-fed. 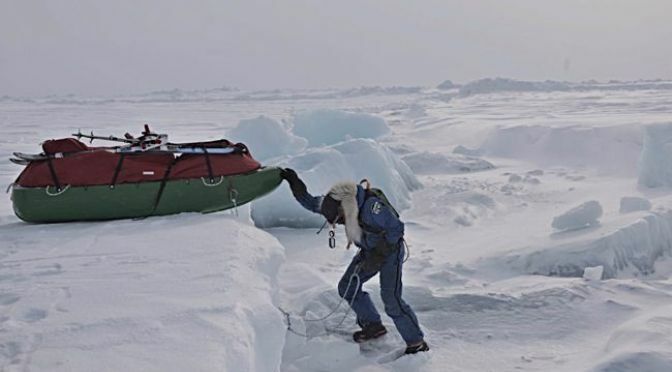 I must say that the first six expeditions conducted by Dmitry and Matvey Shparo showed their professionalism in working with children in the Arctic, and to believe that they have not calculated the amount of food and fuel is in this expedition possible. And on April 21 I read: In the morning, we received information that the board FSB expedition leader Dmitry Shparo and journalists flew from Murmansk Murmansk-Nagurskoe Barneo to finally take home a group of young explorers. 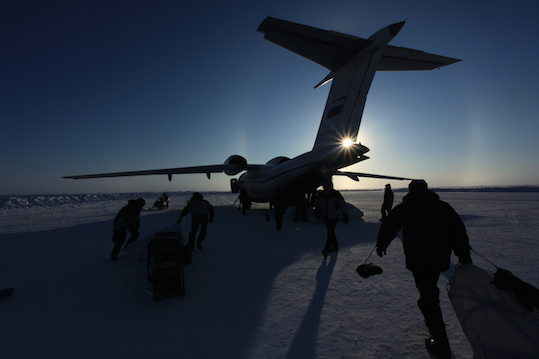 Due to bad weather in Nagurskaya plane was delayed from leaving for a day (or slightly more), but now everything behind – after lunch guys departed from the base Barneo to the mainland. Actually, the annual youth expedition never stops for the night in our tents, do not use our An-74. They need only runway that could make a landing plane FSB and helicopters to get to the starting point and then come back. 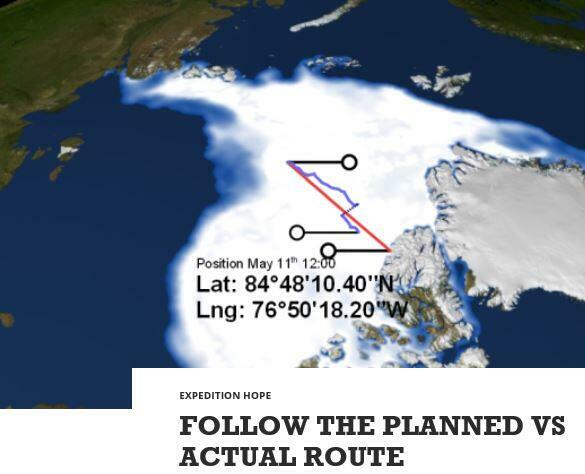 In the same year due to inadequate behavior of the Arctic member of their team Ombudsman for Children Mr. Astakhov went awry – the mainland came from him distorted information from the route, which is why the guys had to be evacuated and place for an overnight stay in the wardroom base. But every cloud has a silver lining – now they can tell the guys from previous expeditions (just 7 seasons Shparo raised almost 50 young explorers), lives and works as a base Barneo. Since today is the last day of the camp, and the team began to dismantle the housing units, the guys had a weighty assistance in dismantling tents – extra hands on the ice does not happen! I thank them very much for your help! Obviously there is a good story here. I would like to hear the “Ombudsman’s” and “Pavel Astakhov’s” version of what happened. I can only imagine what you run into when you take the kids to the North Pole. ARCTIC SEA-ICE MELT—RESURRECTION OR ZOMBIE? 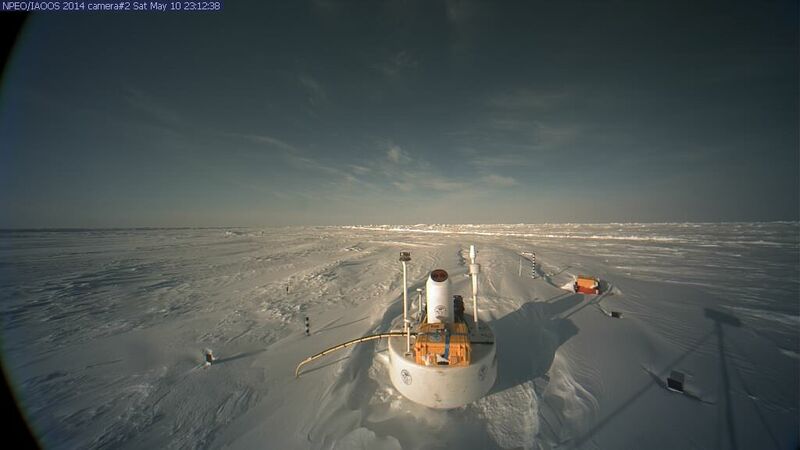 I began these posts as a way of investigating claims that the North Pole was in a “death spiral,” and that we might soon see an ice-free Pole, which would lead to run-away Global Warming because an ice-free Arctic Sea would absorb heat rather than reflecting sunshine with white ice. I had to investigate these claims, partly because I wanted to know if the world was really undergoing a dramatic change, but also because it had become obvious the media was completely failing to do its investigative duty. They were not making any effort to investigate what they were told, and instead merely echoed what they were told. This disgusted me. I was brought up to be an educated voter. One way of educating myself was to read the papers. However the papers started reporting things they had been told that I knew were false. The first examples that sprang out from the pages of newspapers to catch my eye involved the subject of the Medieval Warm Period, which I happened to know an inordinate amount about, because I began studying the Vikings of Greenland before I was five years old. (This occurred because both I and my father grew up close to a silly monument called Norumbega Tower, on the banks of the Charles River. This tower was erected because a Harvard professor, Eben Norton Horsford, (perhaps threatened by Irish Catholic immigrants), dreamed up the idea that Vikings were basically Lutherans rather than basically Pagans, and that it was important to prove Norse Protestants had discovered America, rather than the Mediterranean Catholic, Columbus. Such farmers were rapidly fading from the scene as Weston became a “snob town” during my boyhood, however I was friends with the son of such a farmer, and also the daughter of such a farmer was an old lady who ran a nursery school right next door to my home. I heard a little lore, but it was impossible to do any verifying archaeological digs, as an important knob of granite with petrographs had been turned into a quarry hundreds of feet deep, and a reservoir crossed by a superhighway buried a second site, and the third site was disturbed by Eben Norton Horsford, and then turned into an amusement park which was replaced by a five star hotel, and crossed by a major railway and two interstate highways with cloverleaf ramps. Therefore I was stuck with Yankee lore. As Eben Norton Horsford demonstrated, lore is liable to be polluted with a lot of warped and self-serving stuff, but it was all I had to go on. From 1956 to 2003 I made a hobby of studying the possibility of Vikings in New England, and in the process had to sift through a lot of lore to find tidbits of fact. In my own way I gathered a fair amount of data about the Medieval Warm Period in Greenland and New England. Once I started doing the investigating that reporters should do, (if they ever want to be called “investigative reporters,”) I saw many things that were extremely upsetting to me. In essence, the entire “Global Warming” issue appeared to be an exaggeration created for reasons that cared little for the public’s desire to base their votes on truth. This series of posts is my notebook. It is the portrait of a voter’s study, as he strives to become an independent, educated voter. It includes scribbles, scrawls and doodles. I have pretty much concluded that Climate Science is an outrageous sham and fraud, and that laws have been broken. Therefore further research may be more or less a waste of time. The people involved in the fraud already know darn well that they are involved in a humbug, and my efforts will not change them. However I’ll continue on a bit longer. As the gale “Campreck” fades away the air associated with it seems to be chilling. A new gale, “Taxdon,” is churning southeast of Svalbard, bringing some Atlantic mildness north on its east side but pulling Arctic cold down over the North Atlantic to its west. As you look at the temperature maps it is important to remember that the “morning map” (actually the 0000z map) has daylight at the top and night at the bottom. (The situation is reversed in the “afternoon map.” ) Noon is at the top, and sunrise to the right, and sunset to the left. Diurnal swings in temperature become apparent as you compare the morning and evening maps. It looks like Taxdon is heading north to bother the people attempting to get work done at the North Pole. Brrr. It is twenty degrees out. (-7 Celsius.) For crying out loud! It is past the middle of April! I figure it is a Zombie Spring. Spring is suppose to be a season of hope and rebirth, of life being resurrected just as Christ was resurrected. However doing my taxes has made me cynical. After paying them I’ll basically be broke. I don’t own anything; I just rent it from the government. Oh well. I came into this life with nothing, and they are just helping me get used to the fact I’ll leave it with nothing. But spring is suppose to be more hopeful. When things rise from the grave without hope in a cold, cold spring, they are zombies. Heck if I am going to put up with allowing life to be reduced to that. I’m not bowing out without a fight. 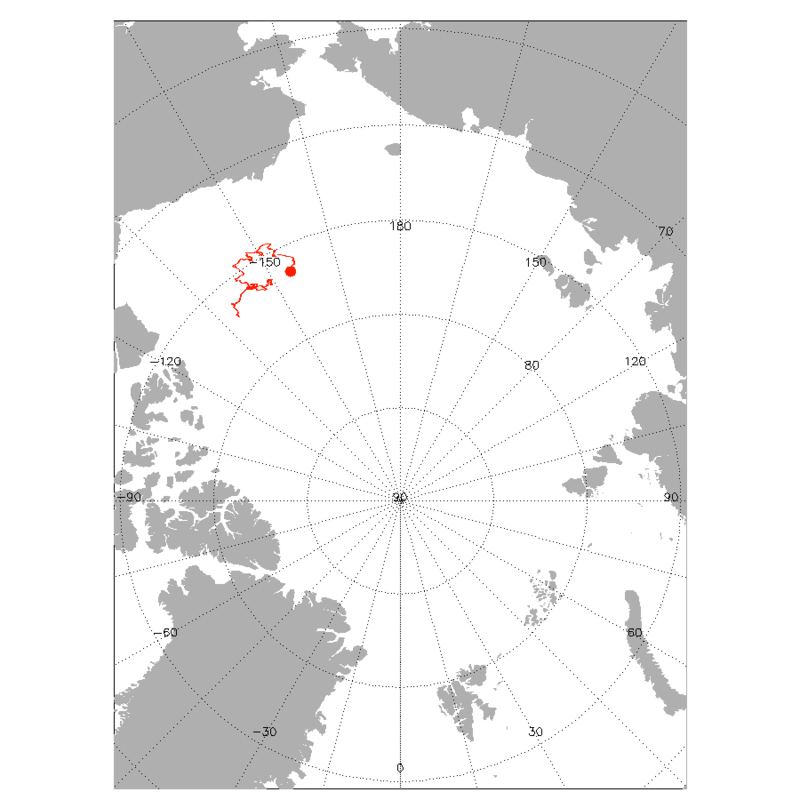 “Taxdon” has swung from Svalbard to Franz Josef Land, and is expected to curve up towards the Pole by Sunday. “Taxdonson,” which gave us snow here a few days ago, has crashed into Greenland, and in transiting the 10,000 foot tall icecap is undergoing what I call “morfistication.” It will dance with Taxdon, doing a northern version of the Fujiwhara Effect, which will propel it further south, along the north coast of Scandinavia. The sea-ice on the Atlantic edge must be taking a real battering from these storms. 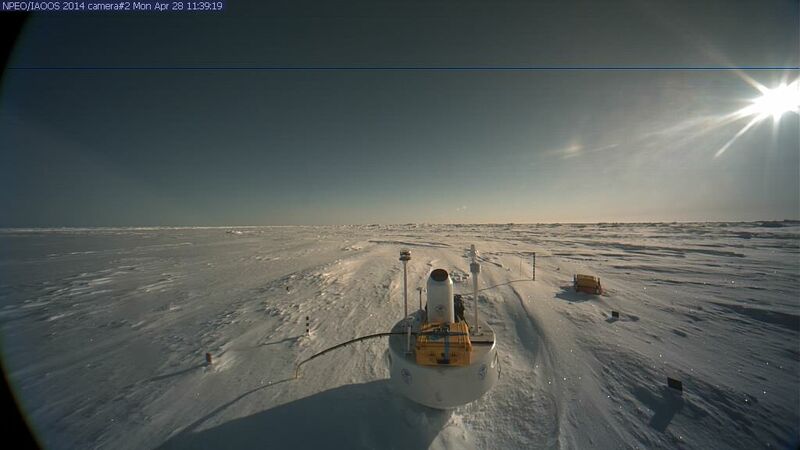 The North Pole Camera has moved 1.3 degrees south of the Pole even before taking its first picture. Once again it is twenty at dawn. (-7 Celsius.) The chill has moved all the way south to Florida, where it is clashing with Gulf of Mexico warmth and brewing up some rains. I hope that mess stays south of us for Easter. “Taxdon” continues to approach the Pole. The central pressure is now down around 960 mb. A warm sector seems to be pulled north over the Kara Sea, while cold air is rushing south to Svalbard and Barent Sea. All winter long there was open water north of Svalbard, however recent events have brought the ice south to the north shore of Svalbard, and even down the west coast a ways. Nor is it thin. The Navy satellite map hints it is six feet thick. “Taxdon” is starting to weaken over the Pole. 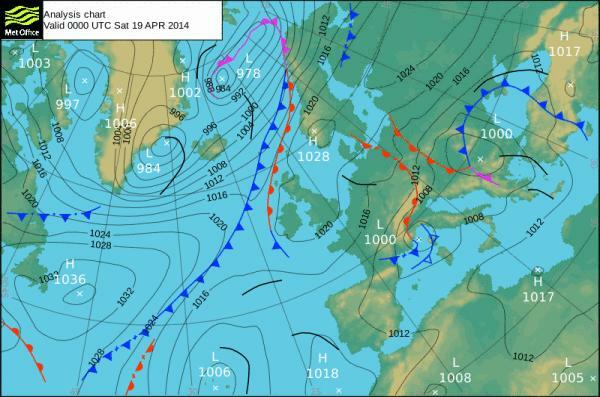 Looks like strong high pressure building over the Atlantic. I’m curious about what’s happening in Europe. 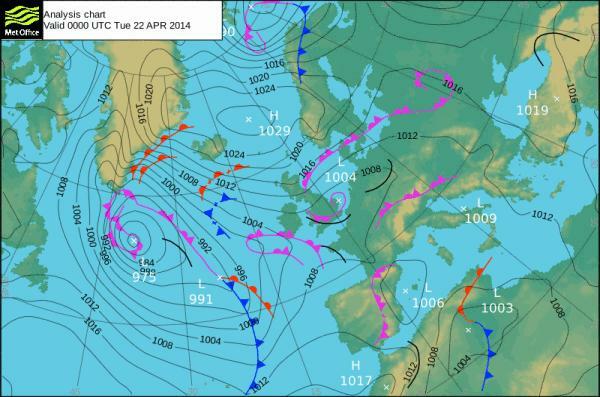 The front pushing across the Atlantic is stalling before it can cross the British Isles. The weak low pressure over the Mediterranean is fading backwards to the west, retrograding towards the waters south of England. 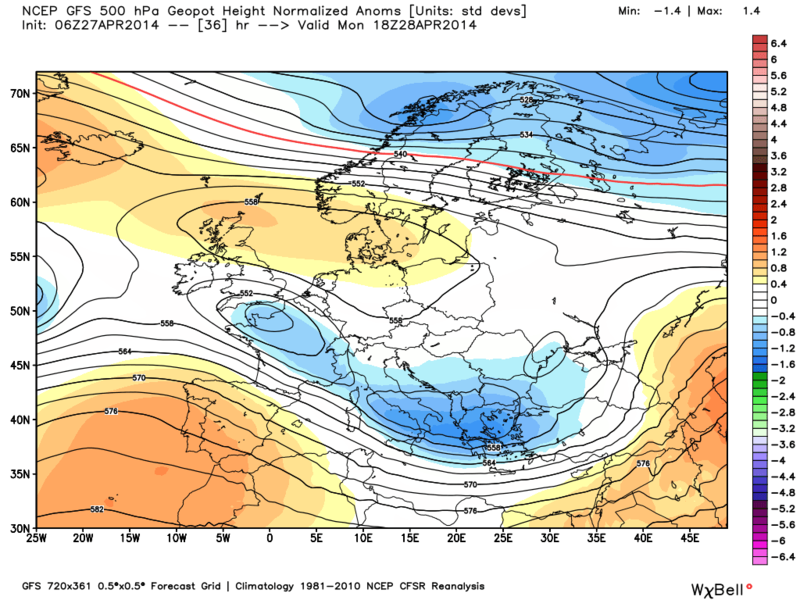 Blocking high pressure is again building over Europe in the upper atmosphere. “Taxdon” continues to weaken over the Pole, as “Taxdonson” has scooted along the arctic coast north of Scandinavia to the Kara Sea. When you look at these maps you need to remember Asia is vast. Temperatures in the west (left side) are depressed by the fact it is the wee hours of the morning berfore dawn, while in the east( to the right) the sun’s been up a while and it is noon in the Bering Strait (just off the map). 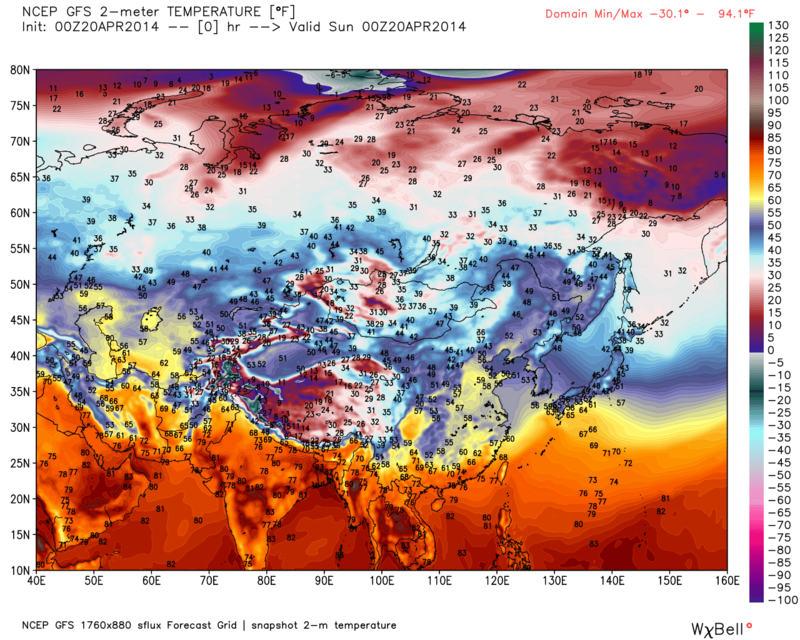 You can see that, despite the lengthening days and shrinking nights, the air is still chilly in Siberia. (The snow cover hasn’t melted completely away.) It is not yet the “source region” of warmth it will be in high summer, though it is not the source region of frigid cold it was in the depth of winter. It was 28 F (-2 Celsius) when I got up yesterday, but the twilight held the promise of a sunny day, and the sun has power now. It is as high as it is in late August. As I worked cleaning up the mess that has been revealed now that the snow is gone, it warmed up to 58, (14 Celsius), and my wife and I thought it might be nice to go out for icecream. However we were so busy we never managed it until sunset, and the chill came back. However we refused to be cowed, and ate the ice-cream shivering. This morning it is down to 28 again. I confess to yearning for the sun, once again. Actually that is very apropos for Easter, before dawn. 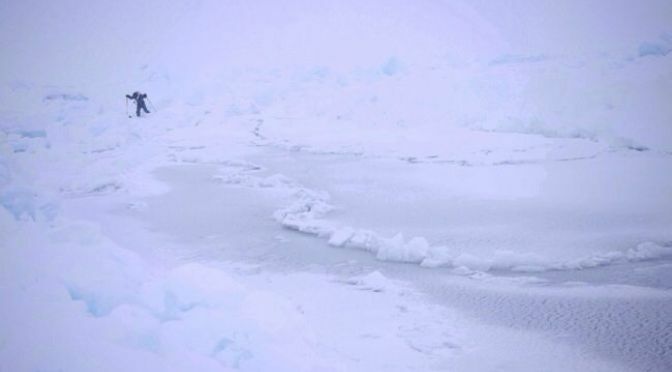 THE MEDIA MISSED REPORTING THE “WORST ATLANTIC ICE ON 25 YEARS” This warning was issued by the coast guard back on March 12, however besides a mention on Yahoo News, in the Canadian section, it was not picked up by other media outlets. The news simply involved the above-average amounts of ice being flushed out of Baffin Bay, and also down the east coast of Greenland. Such ice forces shipping to reroute further south, and to be cautious when entering the St Lawrence Seaway. I think the signigant quote is this one: “We probably haven’t seen a winter this bad as far as ice for the past 25 years,” said Voight, referring to both the amount and thickness of the ice. To me, this is newsworthy. It is an actual event which counters the actual predictions made by those who fear Global Warming. Rather than reporting this fact, and allowing the public to weigh the facts in the manner our Founding Fathers felt voters should weigh facts, the Mainstream Media has been focused on the IPCC reports coming from the UN, which consist of yet more alarmist prophecy concerning Global Warming. If such prophecy is incorrect, then such IPCC “policy guidance” is the utterances of false prophets. If our media only accepts such “guidance” and only echoes it, without questioning it, then our media is failing to do its job. It is up to small bloggers to point out the things the media fails to point out. I should also note that when above-normal amounts of ice are flushed into the Atlantic, it is ice that melts, and as it melts it cools the water to an above-normal degree. Without any actual data, and using a sort of “dead reckoning”, I would assume having cooler water just north of the Gulf Stream would cool the Gulf Stream itself, at least at its northern edge. Even though the Gulf Stream slows to a half mile an hour, in ten days (240 hours) the cooler water should be 120 miles closer to Europe, and in 100 days, (by mid June) 1200 miles closer to Europe. By later September it would be 2400 miles closer, and by early next January it would be 3600 miles closer, and in essence across the ocean and effecting the formation of sea-ice next winter. Theoretically this, and other factors, should lead to much more ice forming in Barents Sea next winter. Or this is what my “dead reckoning” is foreseeing. I am humble enough to confess I am no prophet, and if I am wrong will publicly admit it. However if I am right, and yet the media refuses to report the increase in ice once again, what can I say? A media that refuses to report the Truth becomes an enemy of the Truth, and should expect to be crushed by the Truth. Liars are always surprised by the ability of the simple to overpower their complexity, for they think being crafty is smart and being simple is stupid. However a person with an IQ of 60 who is honest is smarter than a person with an IQ of 160 who is false and devious, simply because Truth triumphs for no other reason than it is true. A dope can be smarter than a genius, in the same manner a little candle can overpower the darkness of a big cave. Therefore stand by the Truth, and you will see the Truth stand by you. “Taxdon” continues to weaken over the Pole, as the flow continues roughly zonal. Temperatures are above normal, at a time of year when it is normal for temperatures to rise fairly rapidly over the Arctic Sea, in the increasing daylight. Last year temperatures were above normal and rising rapidly until mid May, when they dipped below normal and stayed below normal until September. I think this may have been due to the fact the waters of the Arctic Sea itself were below normal at the surface, but others suggest it was due to the “quiet sun,” or perhaps merely due to a coincidental weather pattern of no particular long-tern significance. 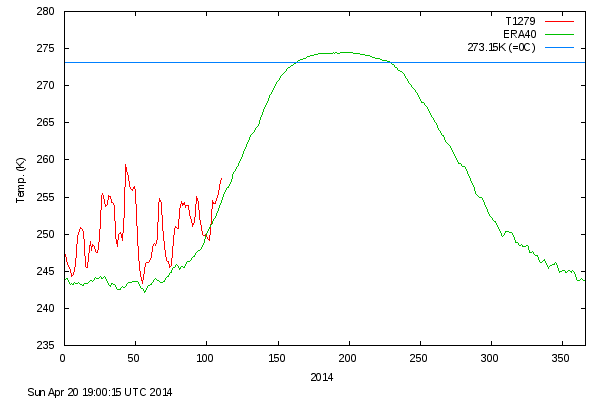 In any case it will be interesting to compare this year’s graph to last year’s, especially from mid May onward. I personally am expecting temperatures to again be below normal. I find it helpful to open these graphs to a new tab. Then you can click back and forth between the two graphs, comparing the rise in temperature. “Taxdon” continues to weaken, but around the edges the flow continues strong. Entrance region is over New Siberian Islands and east Siberia, with exit region over west Siberia, east of Scandinavia. 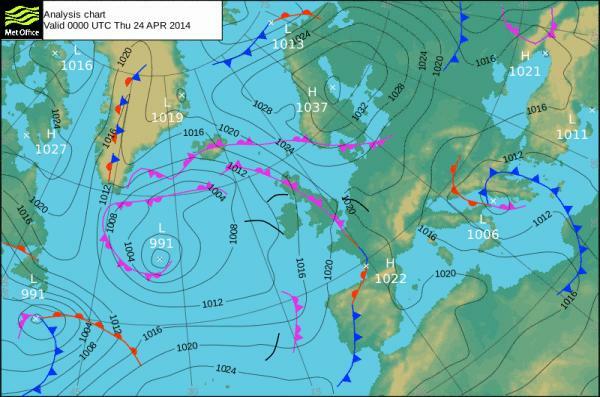 High pressure over Scandinavia. Blocking high pressure is keeping the low south of Greenland from crossing the Atlantic. It will stall where it is all week. Weak features over Europe, with the flow from the east. 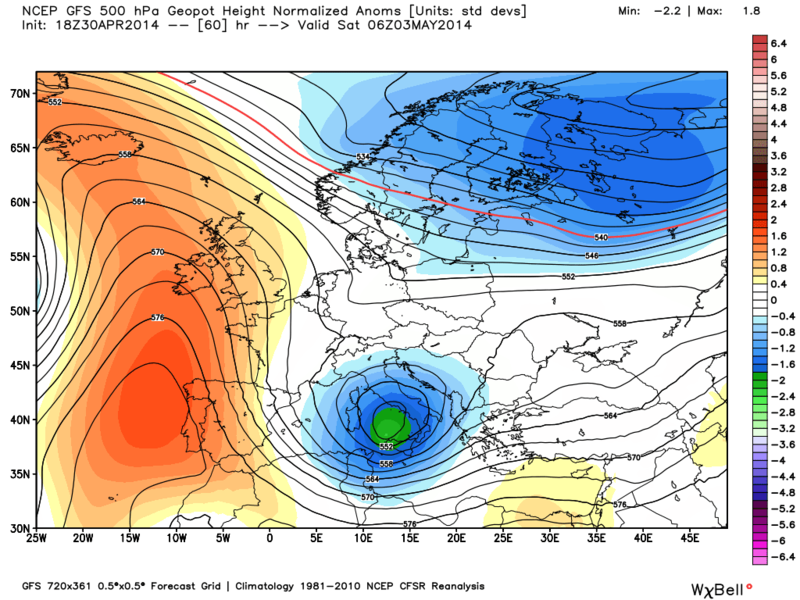 The weakening low south of Ireland has “backed up” from Italy. The only way storms can enter the arctic is to be squeezed up along the east coast of Greenland, and they are weak. Perhaps, like Taxdon, they will develop once they are up there, but no strong gales are charging up there. Despite the fact “Taxdon” is fading away, and the zonal flow a polar low promoted is weakening, the blocking high over Europe, and a second blocking “Beaufort High” on the other side of the Pole, is isolating the Pole and allowing the cold to pool there. Selfishly I am most iterested in the way the European blocking high is backing towards Greenland. This late in the year such highs can hook up with highs down in the south of USA, and rather than freezing my socks off I see benign breezes from the southwest. However those in Europe should rumple their brows at the sight of these blocking highs. 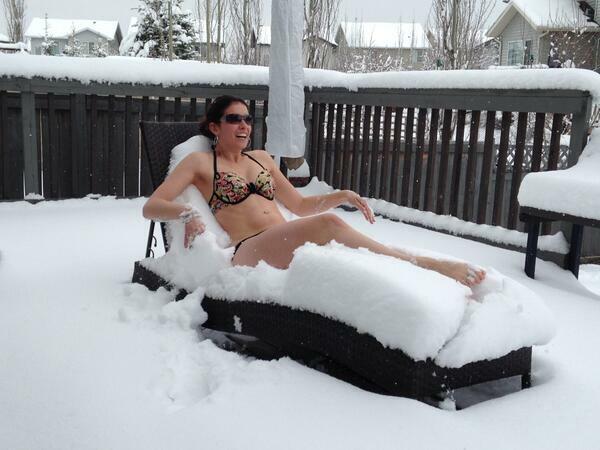 If this was happening in January Europe would be in an icebox. I’ve mentioned before that how one winter ends may hint at how the next winter will begin. I’m just checking to see what a blocking pattern looks like. What a mess, to the south! The Labrador Low cannot head east to become the Icelandic Low, and in fact the ludge of stalled occlusions that extends to the Mediterranean is all retrogade, in the easterly flow south of the block. Warmth isn’t surging north to the Arctic, or even to Scandinavia, which is in a cool flow from north of Greenland. The sunshine up there must be nice, but if this was winter there would be no sun. 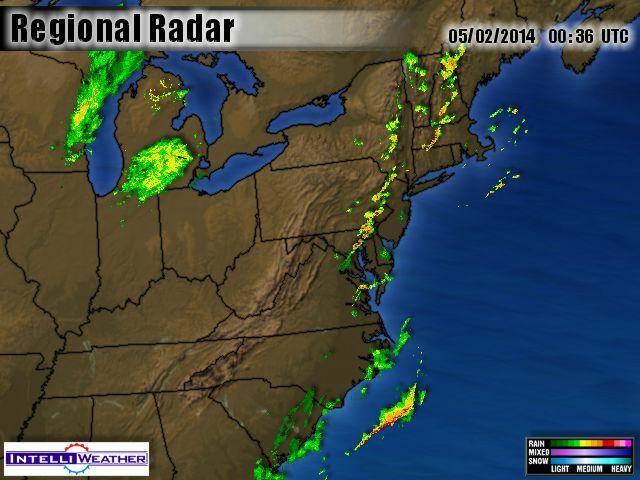 A cold front is moving through tonight with showers, and it is hard not to flinch, expecting snow. However the maps show no snow, nor much cold. Can it be we are going to get a vacation from winter? Local schools are now enjoying a vacation, but when you run a Childcare it means you work twice as hard. All sorts of parents aren’t teachers, and have to keep on working, and they beg you to care for their kids. We are overloaded. I’ve tried to take groups fishing, but the water is amazingly cold, and the fish are still sluggish, and we don’t even get a bite. The buds on the branches are barely even starting to swell. Even the branches of swamp maples, which ordinarily blur into a raspberry mist as early as late March, are only hued a remote shade of purple. Spring remains retarded, despite some nice weather. I try to note hopeful things. Our last mild spell was followed by snow, and then dawn after dawn of frost. I let the all-winter fire at my house go out during our last mild spell only to start a new one and keep it blazing, in the chill. I let it go out again last Monday, expecting to need to relight it again soon, but with the passage of this cold front I might not need to relight it again. That is hopeful. However when the fish refuse to bite, such slender hope seems a bit lame. Easter is a hopeful holiday, as it states not even death can keep a Good Man down. However my little church seems but a fading hope in a bleak and politically correct present. The congregation of hopeful people dwindles by five people every Easter, until I have to wear more than one hat, being deacon and bell-ringer and bass in the choir. Rather than refreshed I feel exhausted, by Easter services, and that is exhaustion connected to a hope far greater than the hope of a worldly spring. When you pay your taxes you also entertain a hope you are not deluded to think some good will come of it. Unfortunately the idiots in Washington tend to dash those hopes. At some point hope starts to look like something other than light. It may be white, but it is like a sheet of white paper that the inky blotches of doubt can darken. Doubt then fosters the illusion that shadow is more powerful than light, as if, besides flashlights that beam light, there could be such a thing as dark-lights that beam shadows. The closest thing to beams of shadow can be seen in those glorious vistas of sky that have beams of sunlight streaming down. Between such beams are darker areas which to some degree can be called beams-of-shadow, however they completely and utterly owe their existence to beams of light. To assert otherwise is to to suggest there is such a thing as a candle of darkness. Such an assertion would suggest that, just as a very small candle can drive darkness to remote corners of a cave deep down underground and far from the sun, a black candle could be lit in broad daylight and drive light to the far corners of a landscape. Such a suggestion is so against our experience and common sense that we laugh at the idea, however it is what our most foolish moods suggest, and what some absurd forms of political correctness insist. In the face of such nonsense something within me blazes hot, as if I am eighteen and not sixty-one. It does not matter if the fish don’t bite, and the buds don’t swell, and people don’t come to the church I adore. It doesn’t matter that my hard work winds me up deeper in debt. It doesn’t matter that the tax collector is a lazy blob with wits that make a leech look wise. I am trying to keep mum about the fire I am feeling, as in many ways it is not politically correct. However if you note changes to this blog in the coming weeks, the fire I am feeling is likely to blame. Low pressure has settled from the Pole down into central Siberia, and the zonal flow has given way to a Pacific-to-Atlantic cross-polar-flow, bringing air roughly from Alaska to Finland. 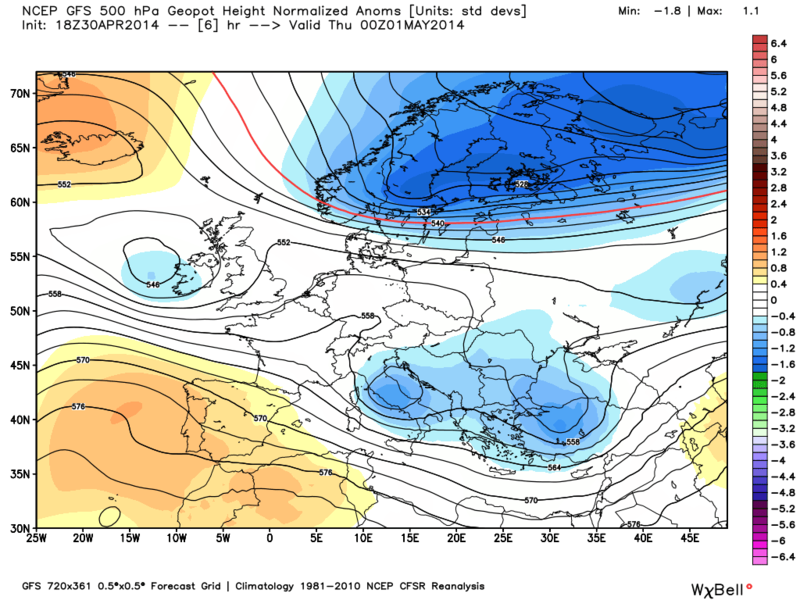 The blocking high pressure over Europe will slide slowly east across Greenland into Canada, until there is a trough forming over Europe, moving in from the east and bringing cold winds from the north over Scandinavia and the British Isle by next week. The situation is quite different from the situation when troughs come from the west. Also it is important to remember that despite the longer days Siberia and Canada have snow cover and their nights generate cold, even if the nights are shorter. When that snow fades away in May things will change. 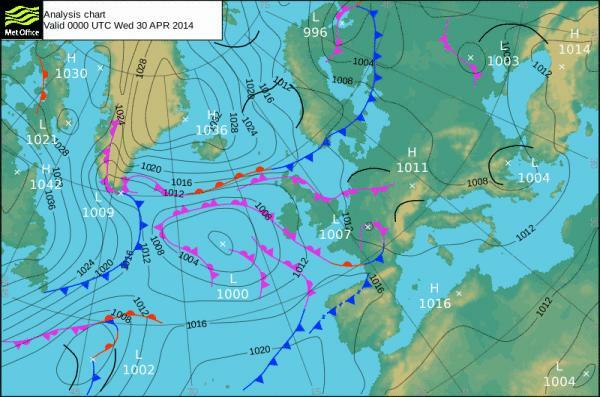 High pressure blocking continues over northern Atlantic. 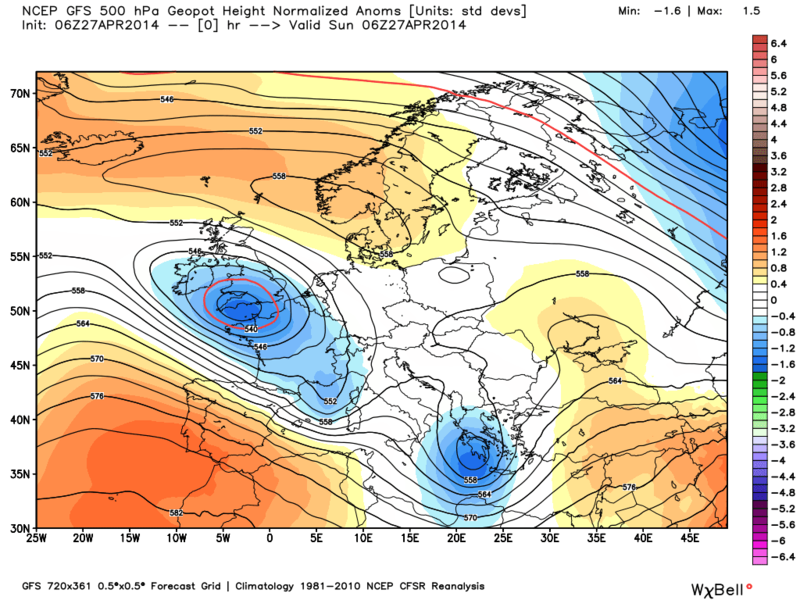 Fine weather up in Scandinavia until the block shifts west next week. Further east the low continues to roll east through Siberia. North of it cold east winds push chill back west into the Kara Sea. The cross-polar-flow will swing clockwise, becoming less Pacific-to-Atlantic and more Canada-to eastern-Siberia. No major invasions of warmth into the arctic in the near future. It is 35 this morning, with the wind roaring in the pines. Here the sky is cloudless, but the radar shows snow up in Maine, and also back to our west in the Great Lakes, which still have some ice. I can remember snow as late as May, but what makes this spring unusual is the persistance of the cold. Rather than the cold snaps standing out, it is the warm spells that seem unusual. I took the smaller kids fishing again yesterday. On Monday it was the older boys and on Tuesday it was the older girls, and in both cases we didn’t even get a bite. The warm-water fish (bass and sunfish) are not even starting to stir. I’d have to seek trout and perch to find some action, and that involves more difficult fishing, when you have a crew of kids that can’t even fish in the open without amazing snarls of fishing line. However yesterday, knowing the smaller kids are even less patient, I went to the small farm pond and spent three hours untangling line and removing hooks from the branches of hemlock trees, but at least the kids caught eleven decent catfish. This gave the kids bragging rights, and a chance to be bigger than the “big” kids, but it meant I had to clean eleven fish. In some ways I’m happier when they don’t catch anything. Being out in the cold wind as the storm blew up off the coast once again chapped my poor hands, which were just starting to recover from the long winter. However there was beauty in the wind wept sky, and in the sight of the swamp maples just starting to bud out. They are very late, and the landscape looked more like March than April, but the beauty of the silver twigs starting to mist with strawberry hues is still striking, whether it is early or late. I see this as the falsification of public documents. The only true warming is my temper’s temperature, which simmers up to a full boil. I really get mad when I consider the fact have to pay taxes to pay people to lie to me. However I get tired of walking around angry all the time. Time to give those bozos a cold shoulder. For all their talk of warming, they’ll feel a big chill from the public soon, I think. This is a very good example of how misleading “extent” statistics can be. Someone can say, with complete honesty, “There was more ice in the spring of 2014 than the spring of 2012,” and (either accidentally or intentionally) ignore the effect of having so much of the water open during the winter. Using my “dead reckoning” approach, I see the waters were open in the dark of winter, when there was no sunlight to absorb and heat could be lost to the stars. Now that there is sunlight to absorb, ice is moving south to reflect it (though it also should be noted it is less ice than normal, even if it is more ice than 2012). In order to see the big picture you need to watch more than a single day. The blocking pattern has kept the Labrador Low from moving east to become an Icelandic Low, but an occluded front did manage to kick east and nudge across the British Isles. The next storm, (dubbed “Wendy” because it made it windy here,) will likely make more progress, kicking a warm frontal “zipper” east and giving the British Isles an actual low pressure system, a bit like last winter. This is a sign the blocking high is eroding, and shifting west towards Canada. With systems moving the “wrong way”, (east to west), the computers will have a hard time figuring out what the future holds. The retrograde systems are not all that common, and there are fewer historical examples to fall back upon. It will be fascinating to watch things unfold. After opening the Childcare, I skipped work to head down to Boston and move my son out of his dorm so he can move back in, in a week. Colleges now have this policy, to keep students from accumulating stuff, dirt, and attracting cockroaches. In many ways it is an absurd waste of energy, but I can see why they do it. It gives them a chance to scrub rooms in a way students seldom manage, and also to fumigate. Also, by briefly uprooting students like tumbleweeds in the wind, it simplifies their lives. My life was never simpler than it was when I was a drifter sleeping in my car, and had my “stuff” down to seven cardboard boxes. Since then I’ve settled down, and after 25 years have more “stuff” than I know what to do with. I fear I’ve die like my father, leaving my kids a huge sorting and cleaning job to do. But a friend told me I shouldn’t worry: After cleaning up after kids, the kids should have a turn cleaning up after us. When students are uprooted the richer kids throw many fine things away. I know a student (who had a place to store stuff off-campus) who made hundreds of dollars simply going through the trash left on the curb and selling it on eBay. However my youngest son isn’t so rich, so most of the stuff he moves out is stuff he moves back in, in seven days. Although the storm moving off isn’t a very deep low pressure system, the winds were very strong, and made stronger by being funneled between Boston buildings. Anything flat acted like a sail, and I had a picture disintergrate in my hands as a powerful gust ripped the frame apart, and moving a table in another gust spun me in a circle. It was odd exercise, and actually did me good. It got my mind off Global Warming, and some other things that make me grumpy. I couldn’t even think much about how wasteful it is to move kids out only to move them back in again. Heading down from these hills to the world of the “flatlander” is to enter a different climate zone, where people can plant vegetable gardens a month earlier, however spring is retarded down there as well. Only descending the final hill on Route Two through Belmont did I see trees hazed by green on the southeast-facing slope, and also the lovely, pink haze of flowering plums, however in the Fresh Pond marshes below that the branches were still barren. I suppose the cold pools down there. In the city itself the only magnolia busting out were on the south-facing sides of buildings. Even the hot-blooded students wore long-sleeved coats in the blustering wind. Rather than making me grumpy and reminding me of the sham of Global Warming, I felt invigorated by the unexpected strangeness of a late spring. It is something new, and newness is what Spring is all about. SNOW IN BOSTON THIS WEEKEND? 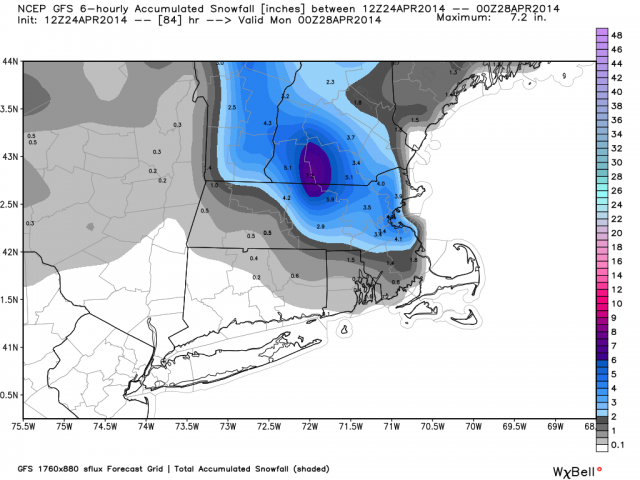 I don’t like the look of this snowfall map, which I looted from Joe Bastardi’s site at WeatherBELL. I live back towards the bulls-eye, where the GFS model is seeing six inches of snow on Sunday. That sure would make a mess of Monday. The map shows “Wendy” departing on the right margin, as a storm I’ll call “Damper”, (as it will put a damper on spring spirits), moves in from the west. Between the two we eked out a decent day, with a cold start just above freezing, but dying winds allowing the high sun to warm us nearly to sixty, (16 Celsius). I knew I’d be hit by a chorus of “kin we go fishin’?” as soon as the children started arriving at the farm, and I wasn’t really in the mood for it. Driving in Boston yesterday gave me a stiff neck and headache today. Usually the traffic isn’t bad between the morning and evening rush-hour, but yesterday was ridiculous. The road crews were out filling the potholes the bad winter left everywhere, but in the wild wind they weren’t working very hard. I can’t blame them: The wind kicked up dust and even blasting sand, and for every man I saw working I saw four big pieces of heavy equipment sitting about idle. Also Massachusetts law insists a police car sit by every crew, with its blue light flashing and the officer taking a nap in the front seat with the engine running and the heater blasting. As I crawled by these sites in the bumper to bumper traffic I estimated it costs roughly $87,696.52 to fill each pothole, in Massachusetts. Because it was school vacation there was another traffic jam at the entrance to every shopping mall, even the little ones. Half the rush was teachers trying to catch up on their shopping, and half was harassed parents dealing with kids the teachers weren’t watching. In the shops over-worked clerks cursed the kids running everywhere while wondering what their own kids were doing. In my humble opinion this is just another example of how schoolmarms, and their all-powerful teacher’s union, utterly screw up society. Don’t get me wrong. I’ve got nothing against schoolmarms. Some of my best friends are schoolmarms. Just because they did everything possible to destroy my soul, when I was a small boy, is no reason not to feel compassion for their pathetic plight. I just would rather be dead, than ever be one myself. Sources of annoyance are kids using the binder twine to whip each other and the resultant tears, kids using binder twine as a jump rope and trampling the chives, and kids wanting to watch but never to lift a finger to help. It is easy to trick them into helping, I have learned. I simply say they job is difficult and they couldn’t possibly do it. Works like a charm, but it is a bit frustrating because I like my trench straight, which is why I mark the row with the the stretched-out cord. The trench is nice and straight where I dig it, and looks like the work of a drunk where the kids lend a hand. This used to bother me, but now I’m thankful and not so fussy. The potatoes don’t seem to mind. We put in twenty feet of pink Potamics, for my wife’s summer potato salad, and sixty feet of Green Mountains, for baking in campfire ashes. The Kennebecks and Kahtadins can wait. I can only take so much. However the children were satisfactorily filthy, and also smelled strongly of worms, because worms are more interesting than potatoes, and we needed them for fishing. We went to the farm pond, where the catfish were biting on Wednesday, but yesterdays cold wind, and perhaps the bright sun, had them hiding down deep and they refused to bite. We didn’t even get a nibble. How then, you will likely ask, did we use up all the worms? It happens, when children cast, and the hook only occasionally lands in the water. By the time a hook is disentangled from a nearby pine, the worm is often missing from the hook. I’ve gotten very good at untangling snarls most would call hopeless, and also in preforming a sort of triage where I scan the snarl, and decide whether it is worth saving the line, or whether I should just cut the line and start over. We go through an amazing amount of fishing line. I keep a sharp eye out for potential danger, and we go through amazingly few band-aids. Not only do children want snarls untangled, but they want hooks baited, lines cast, and fish taken off hooks, if we catch any. They are a chorus of demanding voices that want attention RIGHT NOW. I’ve learned to keep my temper, though it took practice. I almost never get to fish myself. However it does have its rewards, especially when a child catches their first fish. I was busy with another child’s tangle when I heard him exclaim in triumph, and looked up to see him pointing out into the pond. Rather than the bobber floating three feet from shore, which is usually the case with a first success, he had somehow managed to cast it to the center of the pond. Even as I noted his impressive achievement, there was a swirl and the bobber jerked down. Then I got to watch the quiet intellectual whooping and laughing as he reeled the catfish in. Fathers don’t know what they are missing, when they work too hard. Just as we were quitting for lunch, and were reeling the lines in, a young girl caught a small bass, today. It made her day, though she did find the fish “icky.” It reassured me as well, as I feared the winter had killed the bass in that pond, as they like warm water and that pond had three feet of ice at the worst of winter, and I found a large bass floating dead when the ice melted. Parents are often amazed that their children, who are fussy and picky eaters at home, wolf down such odd stuff at my farm. Once again, I just employ reverse psychology. Just as they dig ditches when I say they can’t do the job, they eat stuff when I say it is too grown-up for them. I figure that, if modern youth is going to be outrageously disrespectful of elders, I might as well take advantage of it. And that was it. Parents were starting to show up, to find their children filthy, greasy, and smelling of onions, catfish and worms. They had spent most of their day out of doors. They were ready for a bath and early bedtime. The blocking high pressure is fading west, allowing “bowling balls” of cold low pressure to roll east beneath the block, without greatly changing the cross-polar-flow from Canada to Scandinavia. 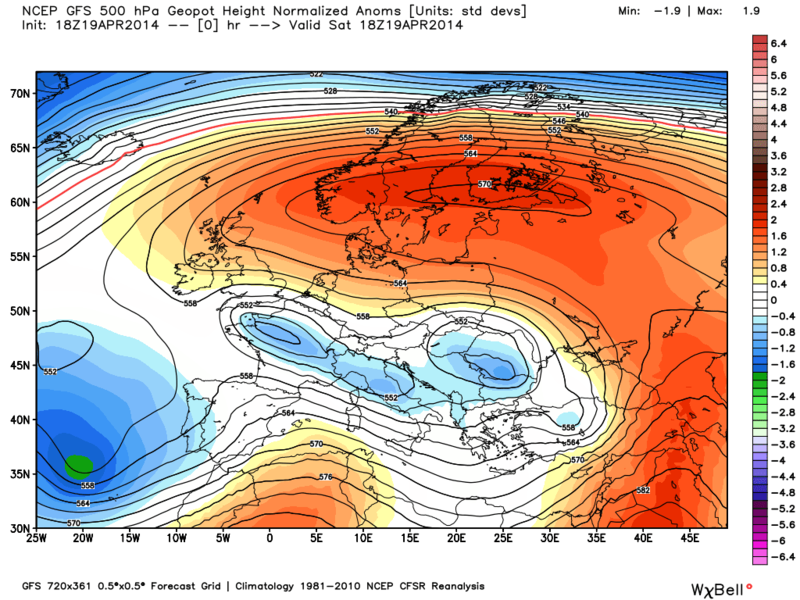 This flow is likely to continue, even as an upper-air-low shifts west from Siberia and flattens over Scandinavia. This east-to-west retrograde pattern is difficult for computer models to handle, and models should be trusted even less than they ordinarily are trusted. West of Iceland the North Atlantic is surprisingly warmer than normal, but back towards North America it is significantly colder than normal. This is “upstream” in terms of the Gulf Stream, and may effect the warmth of Europe later in the year. After being open all winter Barents Sea continues to be exposed to north winds that pushes ice south, and chills its waters and northern Scandinavia. If you scroll up about five maps, you’ll see the sea-surface-temperature anomaly map shows above-normal water off Cape Cod right next to below-normal water off Nova Scotia. 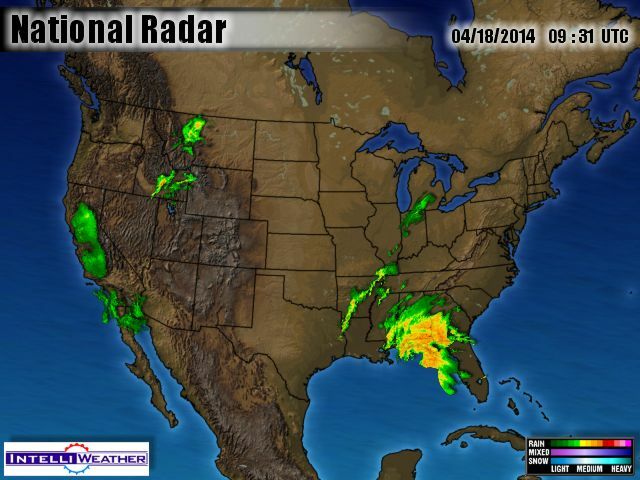 This is likely to brew up coastal storms, such as the one tormenting us now. 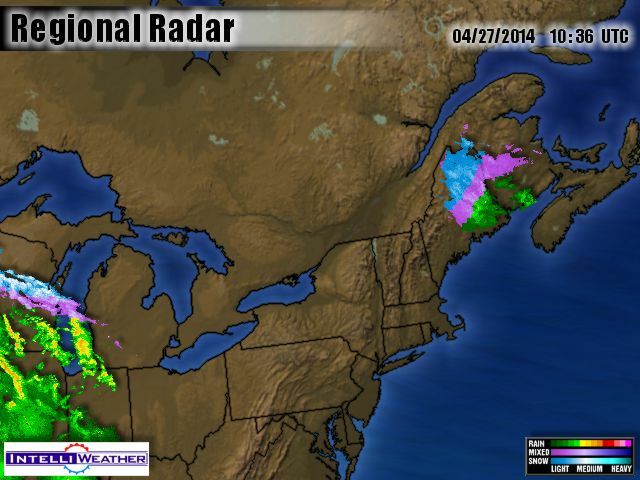 The radar shows the snow up in northern Maine, but not the chilly drizzle falling down here. “Dank” traveled north to Scandinavia, where it was used to describe a pool or water hole, and then became a verb which meant to moisten, to make something wet, as in ” to dank your hair before combing it.” It then moved down into northern England with the Vikings and popped into the English language in the late 1300’s, and then became a noun again, describing the state of a thing after moistening, as in “his hair was dank.” Considering that is what a cold mist does to your hair, it moved on to describe the mist. “Dank” may be fading out of usage, replaced by the word “damp,” however in my opinion “damp” can happen when weather is hot and humid. “Dank” is specially reserved for the north. And that is what I do when the weather is dank: Stay by the fire as much as possible, and think about the derivation of words. 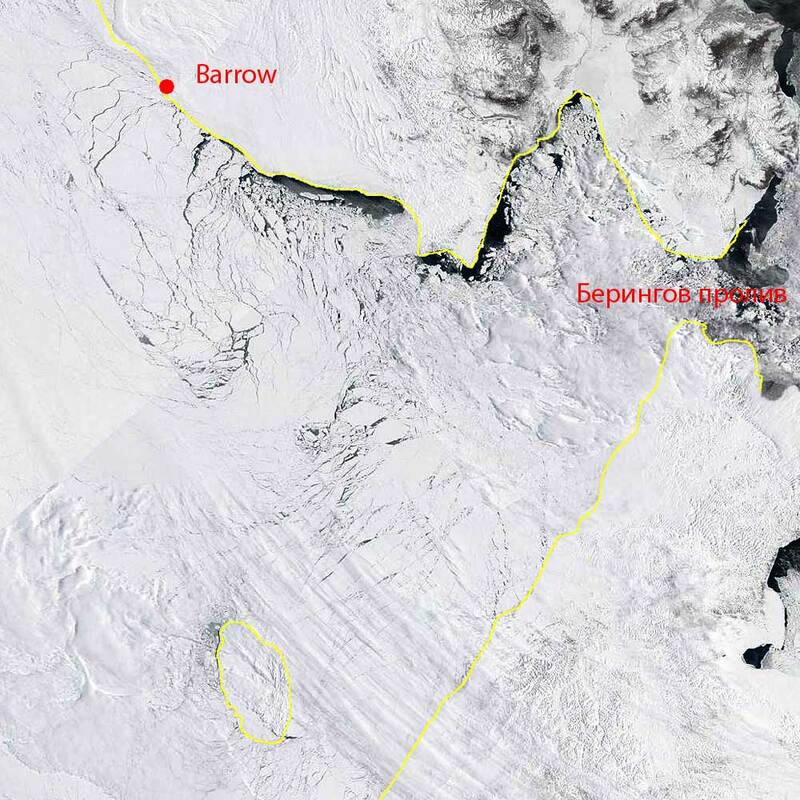 RUSSIAN EXPEDITION TO STOP FOR YEAR IN BARROW? Here’s a picture from April of them passing an arctic oil rig that is empty until the weather warms. It looks like a scene out of Star Trek. Just imagine getting up for 44 days, and all you have to do the entire day is cross ice. I imagine it would get old after eight hours, and I’d be hankering for some distraction, some TV or restaurant or nightclub, after that. I might settle into a sailor frame of mind, but after a week I’d be yearning for shore. 44 days? Yikes! 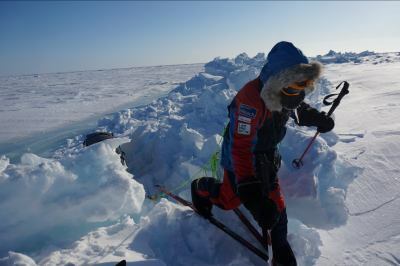 At least these fellows do have modern computerized gadgets and can, in a sense, “watch TV” in the bright nighttime, and listen to music with earphones as they trudge, but I myself prefer looking at ice as an interlude to my busy routine. These two make a non-stop diet of it. It has been interesting to read their comments about the ice they have passed through. 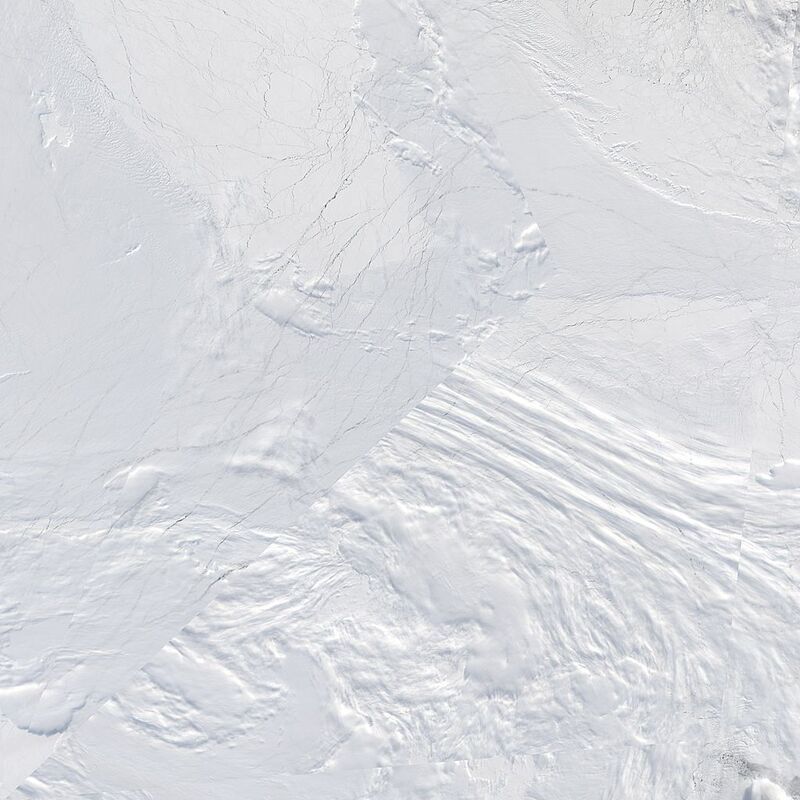 There is more of a jumble of ice, which they call “crazy ice,” and fewer long and solitary pressure ridges. Though they are of the opinion the Arctic ice cap is melting away, and they are perhaps among the last to travel across such ice, they seem to be in some sense ignoring the evidence seen by their own eyes, which is that the ice is thicker north of Canada than it was the other two times they adventured up there. 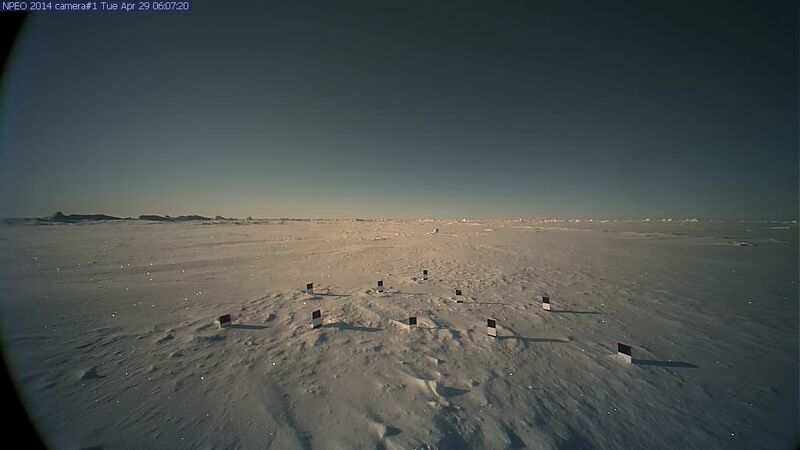 Here is one of many pictures you can view from their sites, showing the sort of block of ice this winter piled up. This ice is drifting to the east at this point, though the Beaufort Gyre usually drifts it west. There are few leads, however once you get over towards Europe and Asia the leads have been more of a problem for adventurers. For one thing, if you visit their site you’ll notice the map they use shows the arctic largely ice-free, with their route on the remaining ice. Perhaps it is a map of September 2012, which was the record minimum, but it is by no means a map of the current ice extent, which covers the arctic from shore to shore: You will also notice they have steadily drifted east of their intended route, until now they will have to hike an extra twenty days to arrive at their destination. I’m not sure, but I think they are just going to hitch a ride on an airplane, when it arrives to resupply them, to get back to their intended route. (I wonder what the pilot will say about carrying that extra weight.) 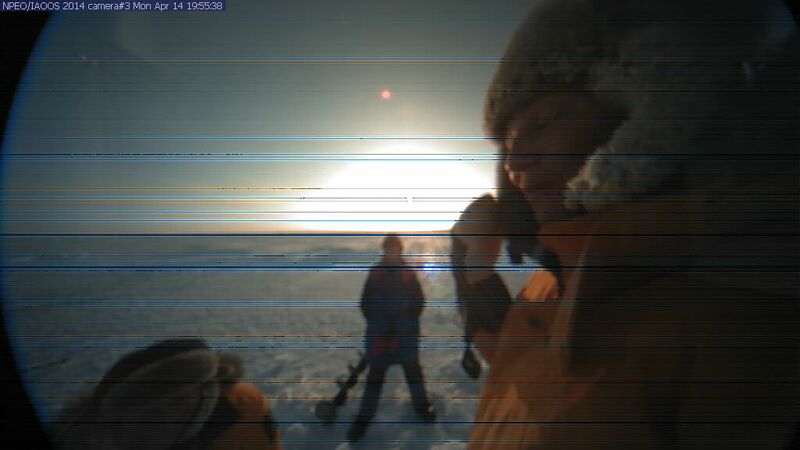 Here’s a picture of the guy and gal scouting for some flat ice a plane can land on: Apparently they set up the camera to take pictures of themselves, as there is no third person. (CORRECTION. My mistake. A second guy took the picture. they are a party of three.) In any case, it sure beats working a real job. And I am not going to complain (unless the images are photo-shopped), because I get pictures of the sea-ice and then can use my lying eyes to judge things for myself. I wonder if any of these young adventurers actually think Global Warming is hornswoggle, but play along for the chance to do some really cool hiking. 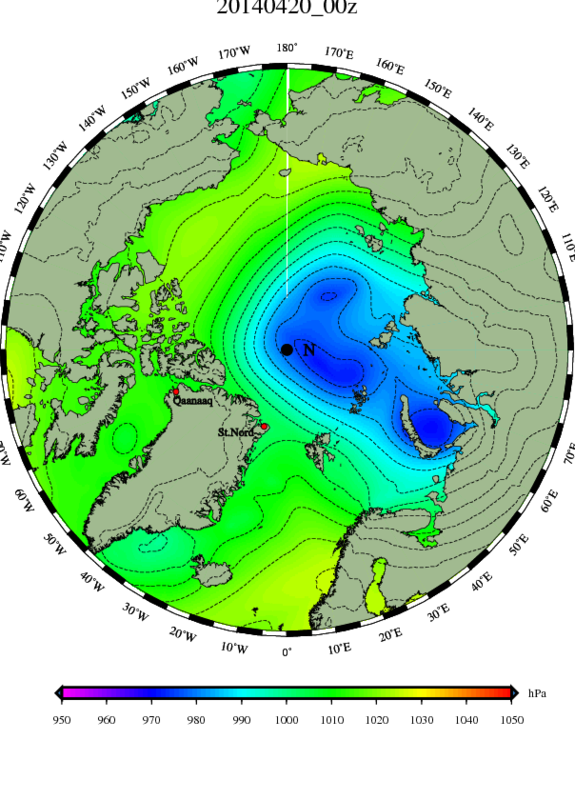 It looks like the cross-polar-flow may be starting to split, with some of the flow curving from Canada over the Pole and down the east coast of Greenland, and the rest directly crossing to central Siberia. I think that low, remnants of “Taxdonson,” over eastern Siberia will weaken, as a new low develops over Scandinavia, in which case the flow down into the Atlantic will persist as the flow into central Siberia fades. We shall see. I’ll be carefully watching the ice north of Greenland. It seems to have halted its west to east flow for the moment, but not until a lot of thick ice was delivered into Fram Strait and flushed south towards the Atlantic. 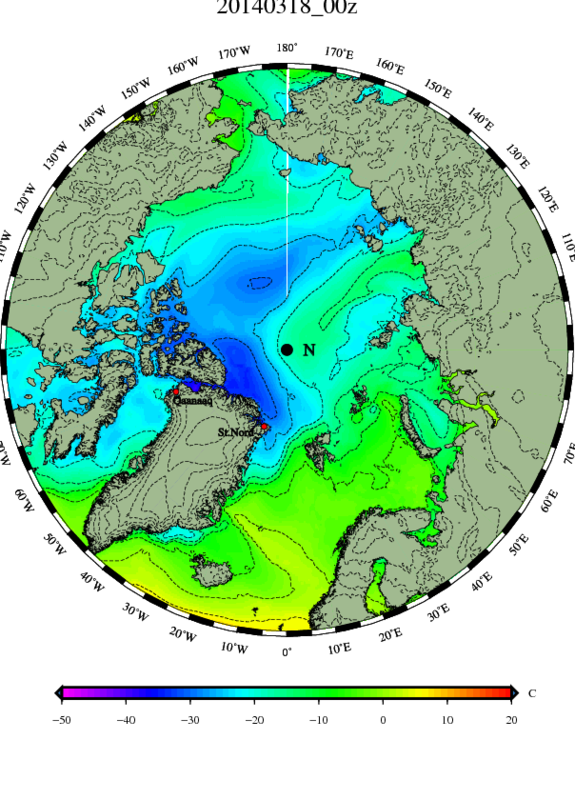 Though this reduces the density of the ice northeast of Greenland, it chills the Atlantic and, I somewhat daringly predict, will allow the ice in Barents Sea to grow very quickly next autumn, (unless some dramatic summer pattern intervenes). Stay Tuned!!! 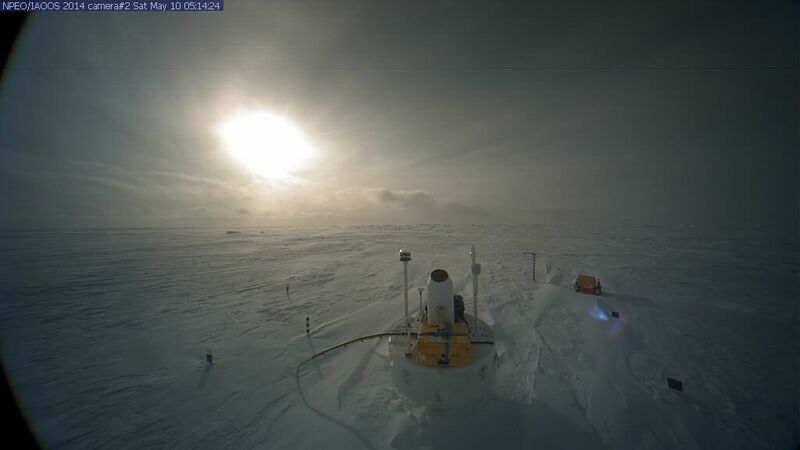 Here are a couple beautiful pictures from North pole Camera 2, taken at around six AM and noon. During that time the sun has moved through ninety degrees of sky. In other words, the camera is not seeing with human eyes, but rather more like a rabbit sees, with its eyes towards the side of its head. In all this wide angle covers roughly 180 degrees. Theoretically, if your eyes worked this well, you could look south and see both the full moon rising in the east and the sun setting in the west. In actual fact, when we look south, the east and west exist in the dim reality of our peripheral vision. Therefore, when you look at these pictures, it is important to remember what you are in fact scanning. These pictures are much more impressive if you click them to enlarge them. If you open them in a separate tab it becomes possible to click back and forth between the two pictures and notice any changes in the ice. 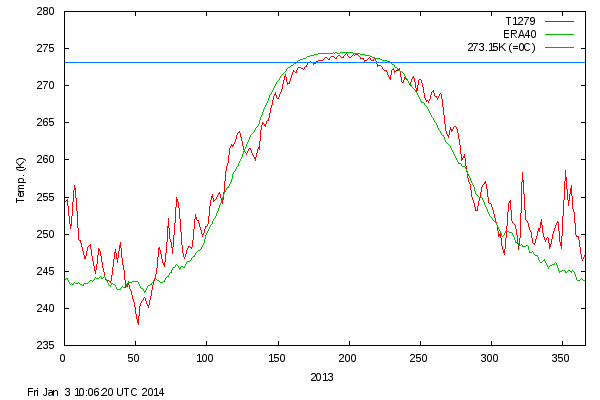 Not much melting usually occurs until temperatures get above freezing, usually around mid June. In fact it can be boring to check out these views, if you are thirsting for something other than serenity. There is the slight chance the ice will crack and a lead of open water will appear, or the ice will buckle and a pressure ridge will rise as a jumble of broken blogs, but for the most part things stay pretty quiet until slush starts to appear in June. Selfishly I am noticing that strong high pressure on the left, on the east coast of Hudson Bay. Is is sucking the cold air north from Canada and depositing it back over the Pole, where it belongs, (as far as I am concerned.) The less cold air over Hudson Bay, the greater the chance we may finally get some spring warmth, off these maps and south of there. The Asian side of the Pole is much warmer, but likely more cloudy, with all the low pressure over on that side. The low over central Siberia is stronger than I expected, while the low over Norway is weaker than I expected. The cross-polar-flow looks like it is trying to swing back to a Pacific-to-Atlantic flow, but in any case the Atlantic isn’t able to invade the Arctic, in the short term. You can see the high north of us effectively blocking moisture, and the moisture is heading from the Gulf of Mexico right up through Canada towards the arctic. The rain to our southwest is being squeezed southeast out to sea down in Virgina, while a little drizzle that doesn’t show on the radar is moving down through Maine behind Damper, but hasn’t made it here. It was 37 again at dawn, but the sky was blue, and the rising sun is as high as it is in mid-August. The refidgerated daffodils smiled in the back garden. They last a lot longer when the weather is cold. I can recall springs that came with heat waves, where the daffodils came and wilted so swiftly I hardly seemed to see them. That may be good for the plant, which wants to get on with the business flowers only begin, but it isn’t so good for the gardener. In some ways this spring is better, because everything is blooming in slow motion. It is much easier to stop and sniff the roses if they aren’t in a big hurry to wilt. 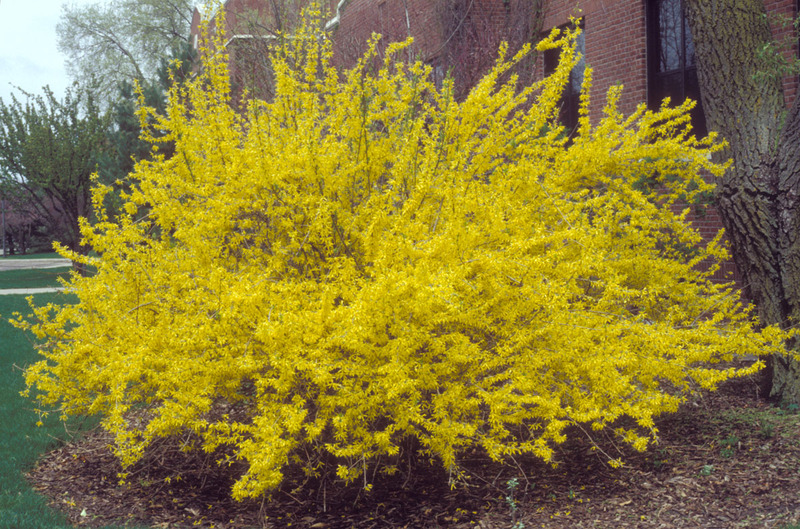 The forsythia began to show yellow buds five days ago, and they are only half open today. The ice looks fairly strong at this point, and if you have the money you can fly up there as a tourist and do some cross-country skiing. 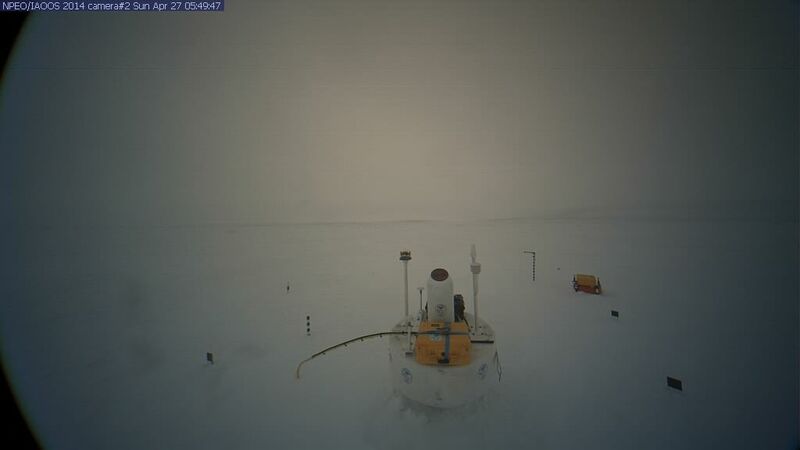 I’m a bit nervous about a fairly strong gale approaching the Pole from the Laptev Sea. 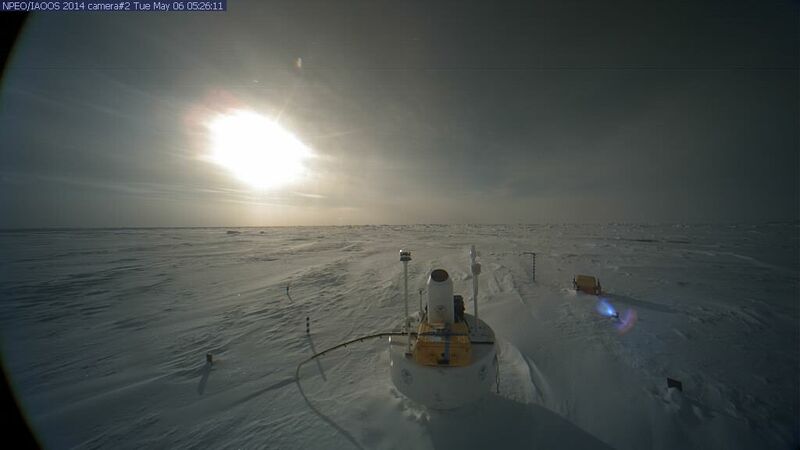 Hopefully all will be completed safely, and we can spend the summer watching the pictures from the North Pole Camera without fretting about the safety of the scientists. I’m sure those who love them won’t mind if admirers (who are inclined to do so) pray for them this Sunday. The storm hit last Sunday, and the wind chill was murderous, with winds steadily over 50 mph and temperatures well below minus 20 Celsius. Basically everyone did the wise thing, which was to get inside tents and stay inside. All groups of skiers today staged a forced day’s rest due to bad weather conditions. By evening, the weather began to gradually improve. A “torosheniem” is a pressure ridge, which is a mini-mountain range formed as two plates of ice crush together. The “open water” referred to is a “lead”, which is formed when two plates of ice move apart. This ice, which jets are landing on, is not all that thick. 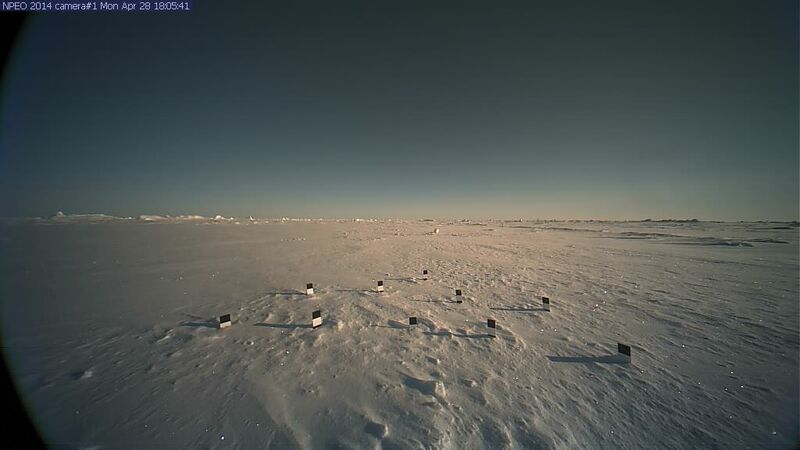 The North Pole Camera crew states it is 1.4 meters thick, or 4 feet 7 inches. The older ice was all pushed towards Canada and Greenland during the winter, and this is largely “baby ice,” or ice that has grown this winter. The danger, (besides meeting a 1600 pound male polar bear), is that the ice cracks and a “lead” opens up beneath your tent. Groups Rick Sweitzer and Annie Aggens requested assistance. Because of the strong counter drift they can not move to the North Pole – despite advance them further and further classifies the target. 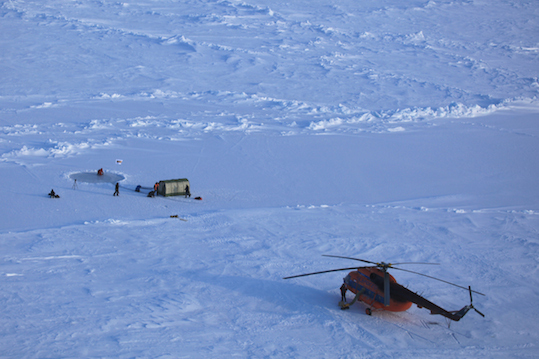 Morning by helicopter, these groups were deployed to N 89 ° 57.05 ‘W and 151 ° 43.24’. Along the way, it turned out that a group of Chinese tourist Annie Aggens frostbitten fingers and had to be removed from the route. One member of the group Rick Sweitzer herself asked her to return to the base camp. Barneo Dr. Stas Boyarsky rendered first aid to the victim of Chinese tourists. 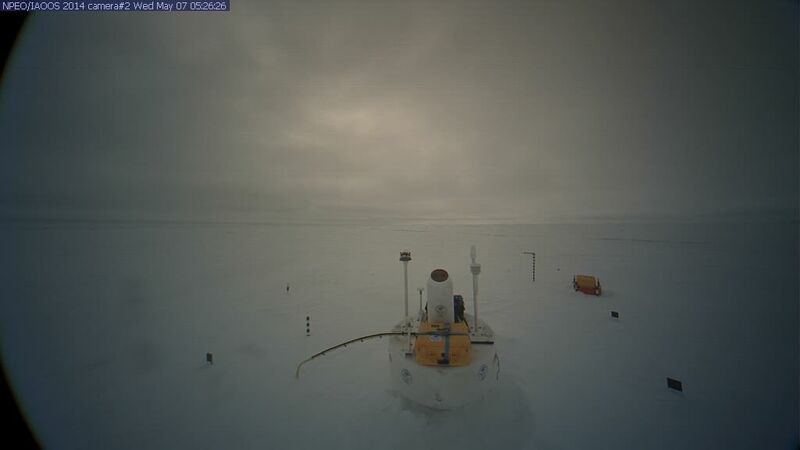 It sounds like a bit of an ordeal, and perhaps it is not surprising that the North Pole Camera isn’t transmitting pictures yet. I wonder if the scientists consider the tourists part of the ordeal. They don’t exactly “rough it.” Here is a picture of their camp kitchen. The chef is cooking cutlets. Humph! Arctic explorers sure are soft, nowadays. When I was young it was just blubber, blubber, blubber, all the livelong day. A low pressure system passing just south of Svalbard looks like it will head up towards the Pole. 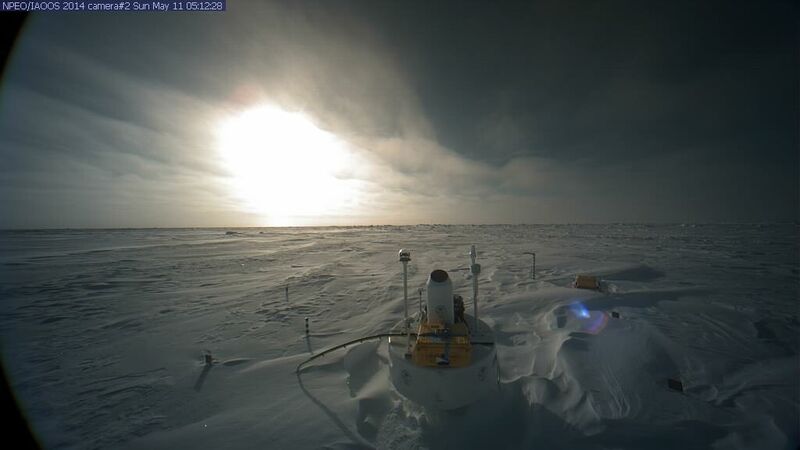 Hopefully they can get the North Pole Camera operating before it hits. 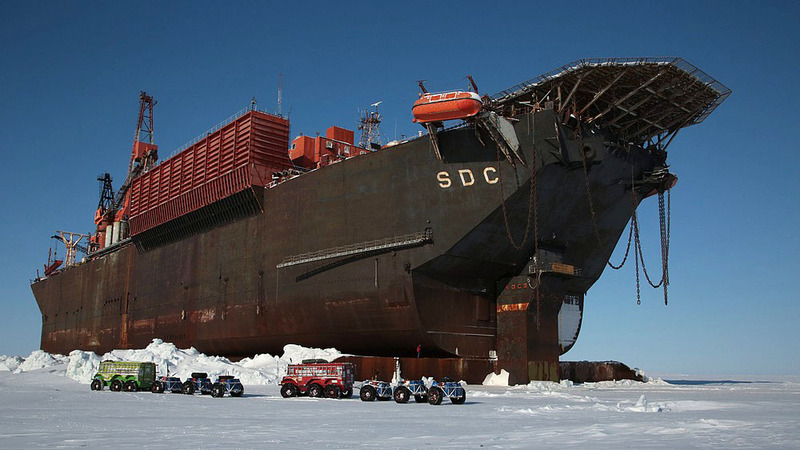 Among the guests was world champion in figure skating Miki Ando (Japan) with the crew – she decided to set the record at the North Pole. Needed for this skater mini-skating rink which Barneo team beginning to flood near the pole. But the film crew arrived with Miki, size “mini” seemed insufficient, and they were asked to increase the area. As a result, the children did not have enough hot water, because of its limited reserves to Borneo.Had to postpone the second part of the event the next day. As a result of the report record results tomorrow, at the same time prepare a photo report – today returned to base late at night. Temperatures were down around minus 24 Celsius. However fame has its price, I suppose. Judging from the view from above, the rink was built on a frozen-over lead. This is where the ice split apart in the dark of the arctic winter, exposing open water to air as cold as minus forty. Though the water is close to freezing, it is so much warmer than the air it steams like a hot cup of tea, until it freezes over. 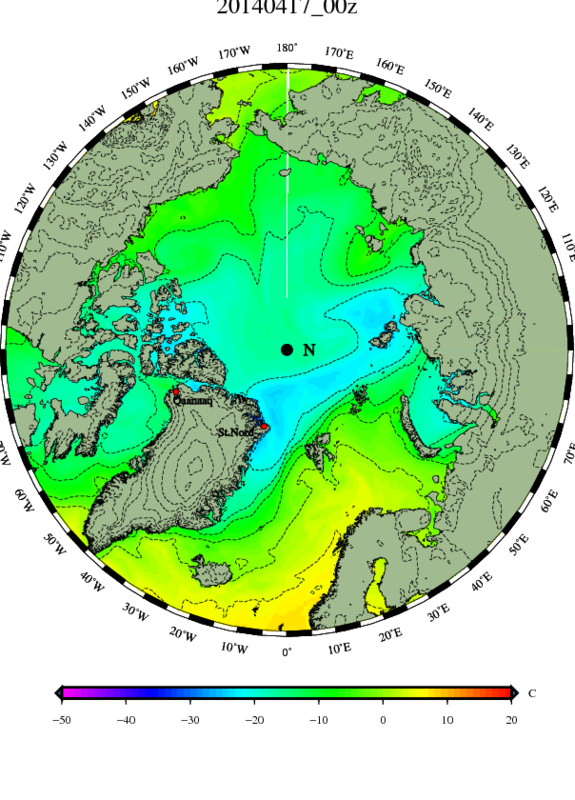 Leads freeze over swiftly under such circumstances, however I think the exposure of the Arctic Sea, during windy winters, must chill the water more than it is chilled during calm winters. They are working in the calm between two storms. The next storm will be atop the Pole by Sunday. Shucks. I suppose I’ll have to put off my figure skating up there until next year. It is hard to grasp the entire situation through translations, but apparently the Russians bring a group of children up to the Pole, and have been doing so for several years. This year, perhaps due to the storms, the adult supervising the children, (they can’t be too young, and may be teenagers,) became anxious about shortages. As this person was “tweeting” his concerns on his twitter account, the concerns drew attention and many became concerned. 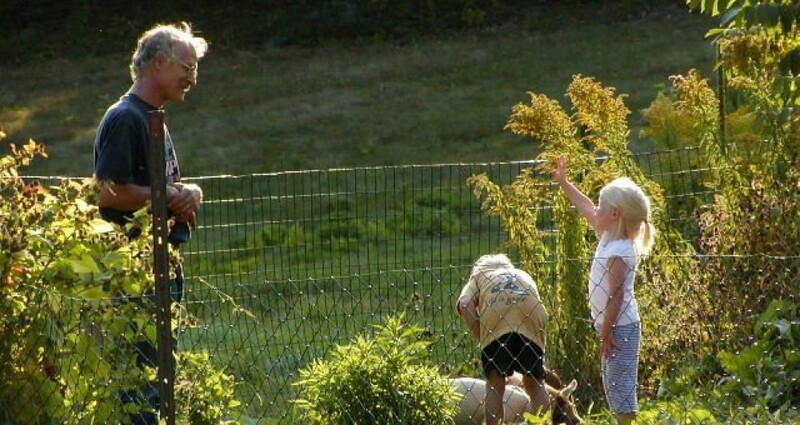 Obviously there is a good story here. As a childcare provider, I occasionally run into situations where parents are extremely anxious about children being outside in cold weather. I can only imagine what you run into when you take them to the North Pole. 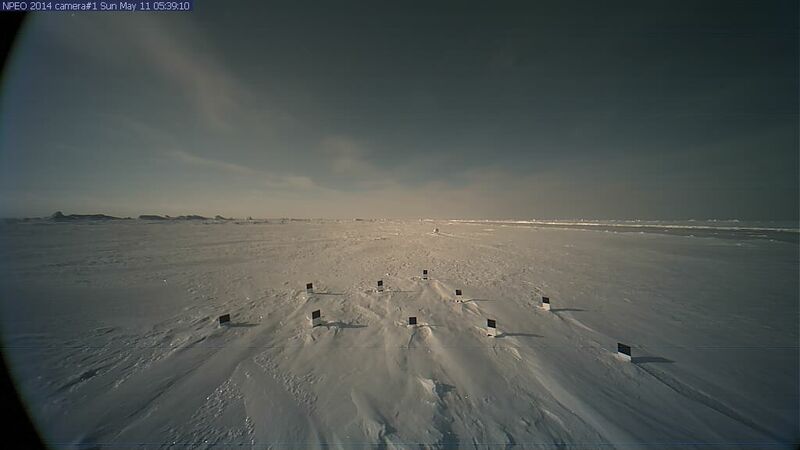 In any case, they are closing down the base, and leaving us with a sense the ice is not weak up there. After all, they land jets on it. However that ice is tortured and smashed by strong winds and storms, and there are cracks constantly opening in the ice. 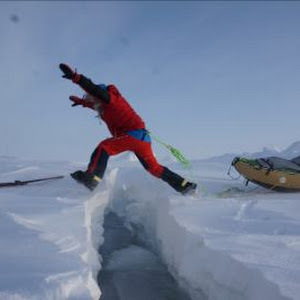 Therefore I’ll close this thread with the view from an airplane of a big lead, as it starts to form a new skim of ice despite the fact the sun has risen at the Pole, and also a picture from one of the daring adventurers who are now gallivanting about up there, as they leap over a much smaller lead.